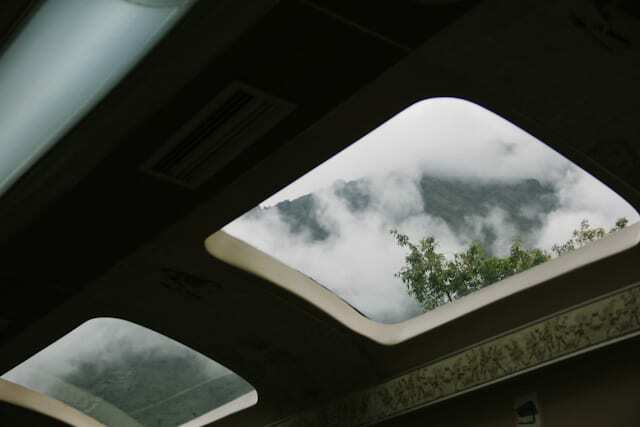 The views from the train were absolutely breathtaking! 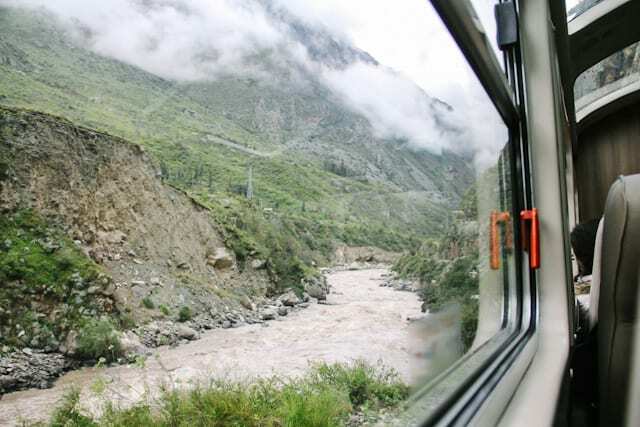 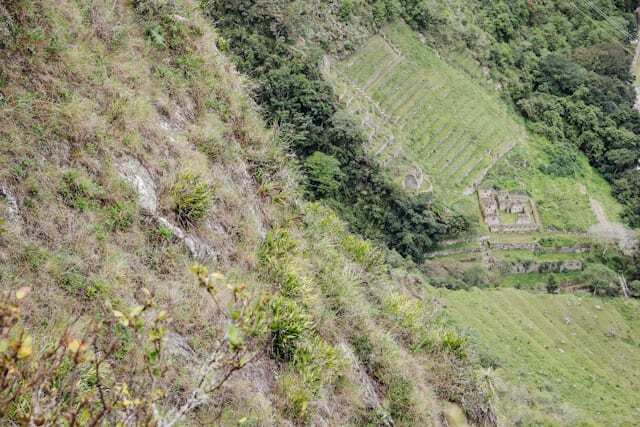 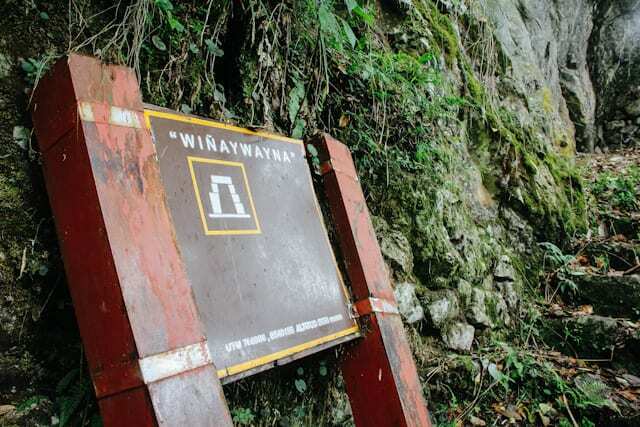 The train track is between a sheer mountain edge and the Urubamba river which has been known to wash away the train track when in flood. 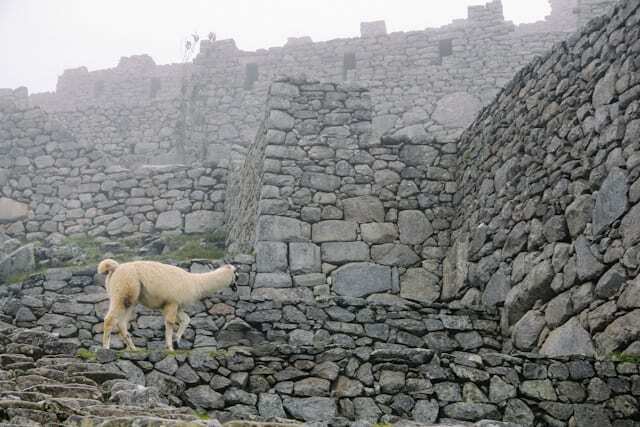 Our first Incan ruins of the day. 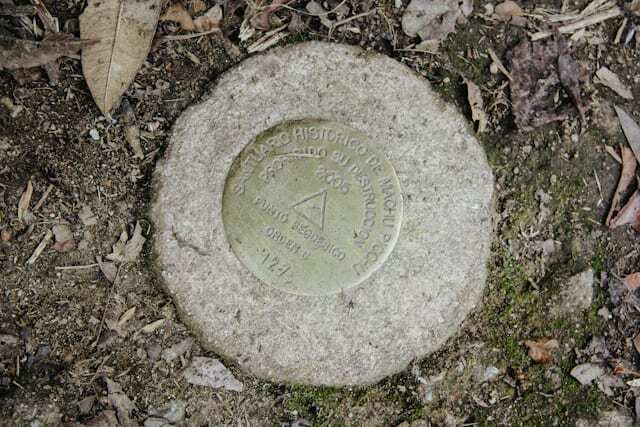 Believed to be a trading post or “toll” road entry point. 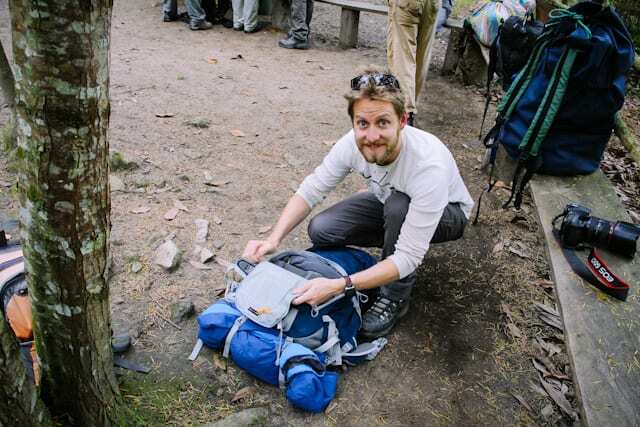 Andy in full hobo gear including Spar packet over is camera to keep it from getting wet. 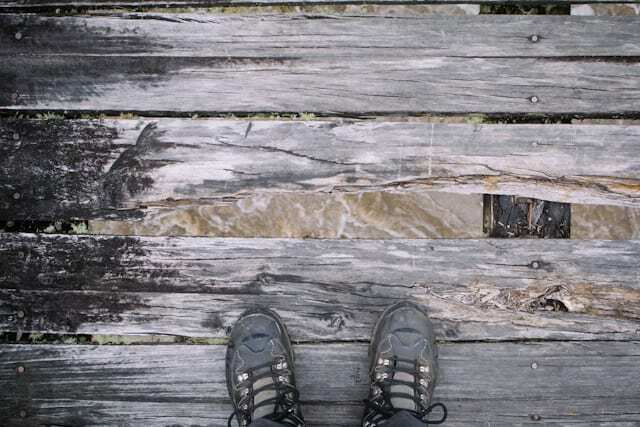 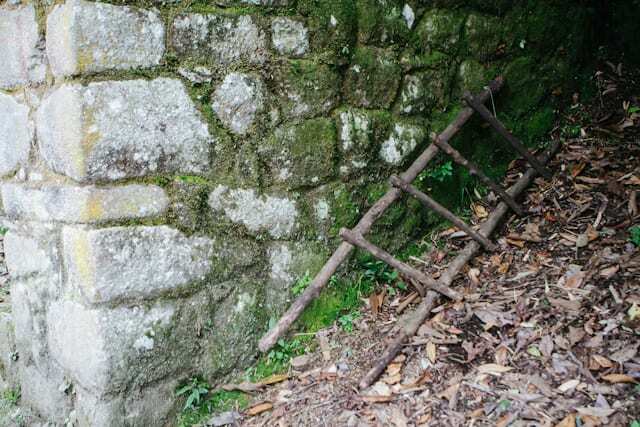 On parts of the trail the stairs are quite rough and rustic which can be a bit tricky when its wet. 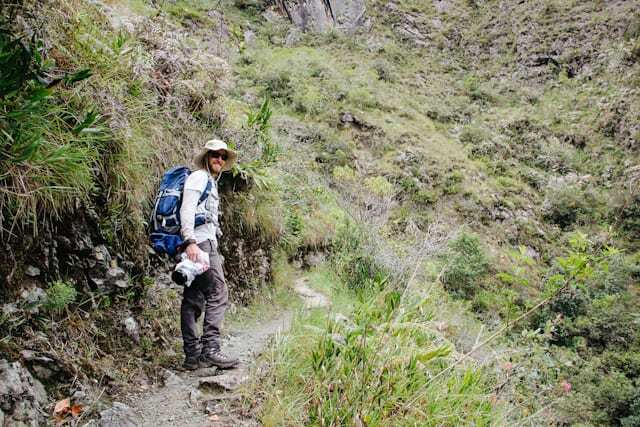 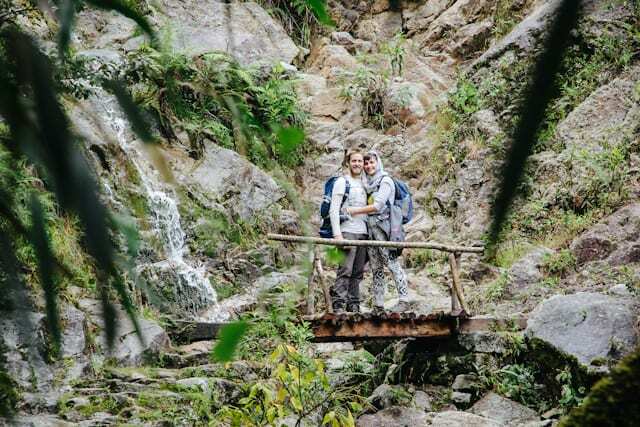 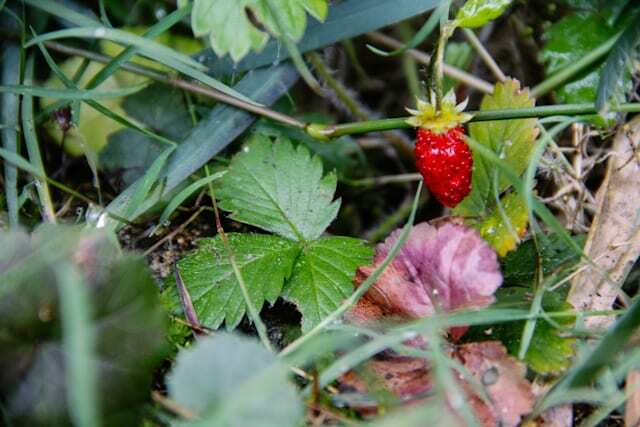 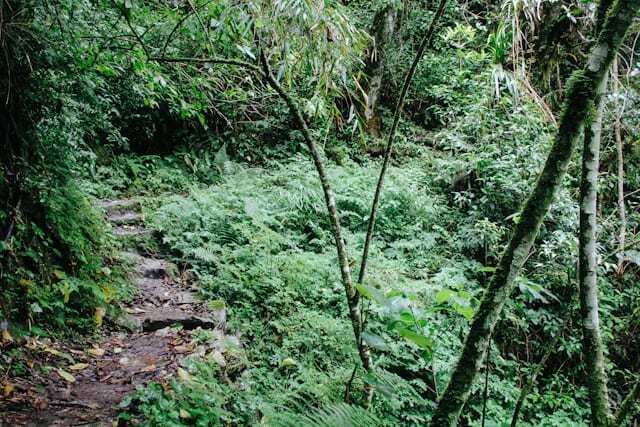 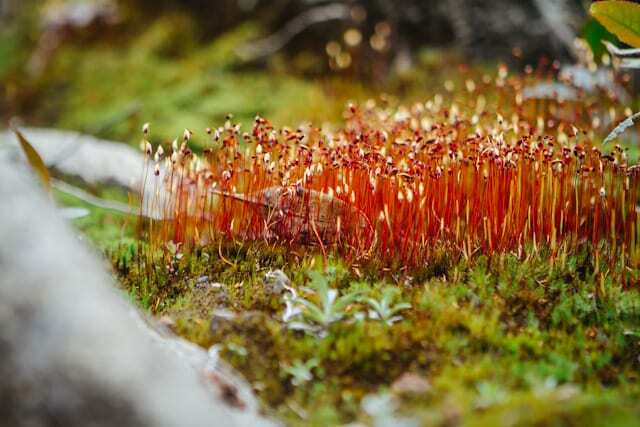 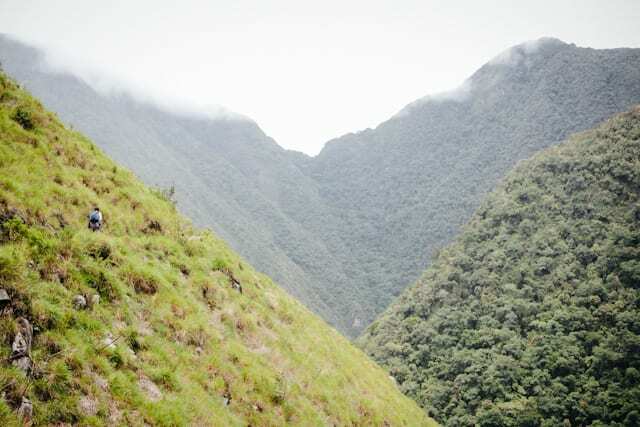 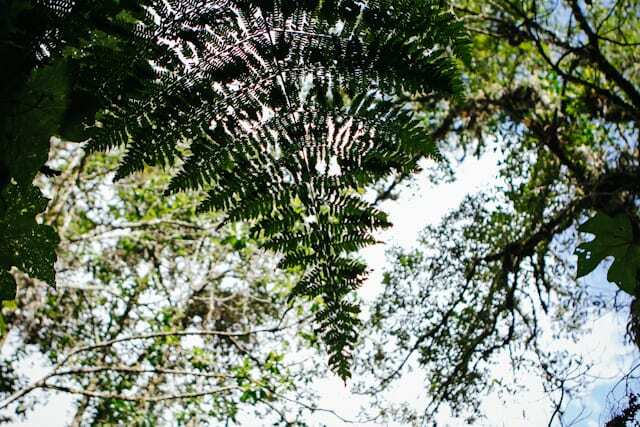 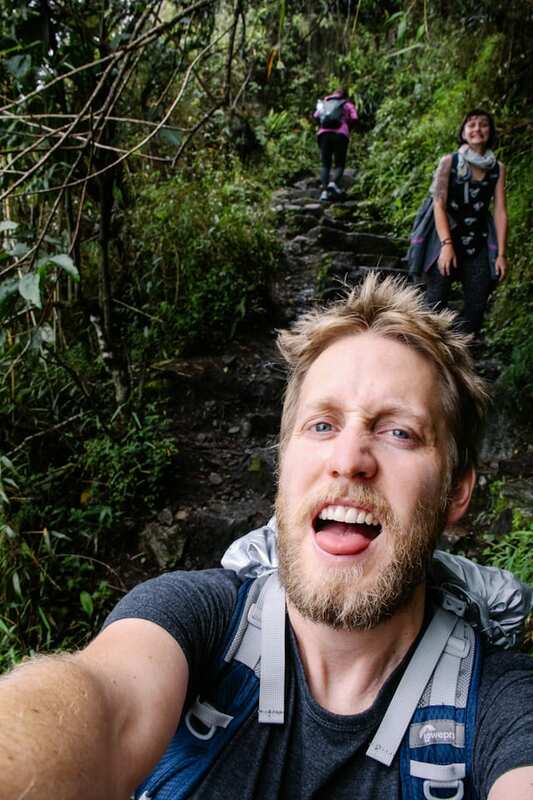 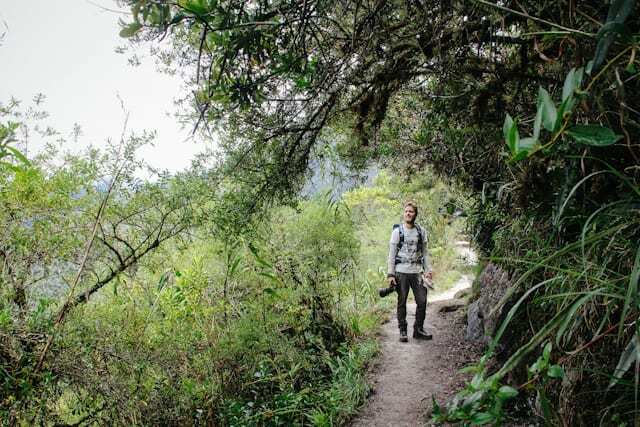 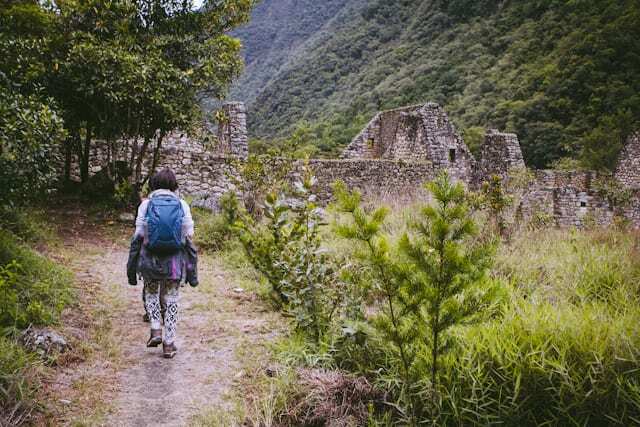 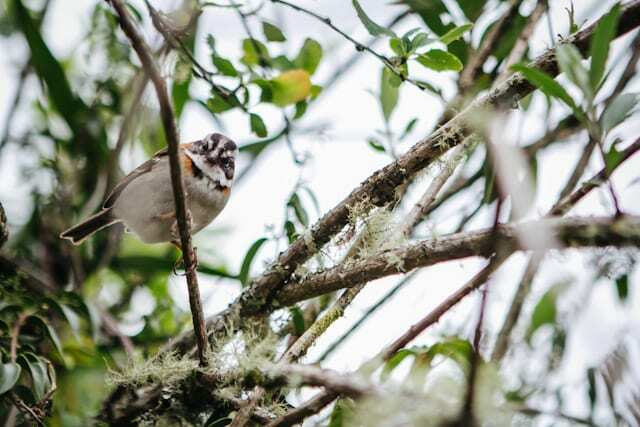 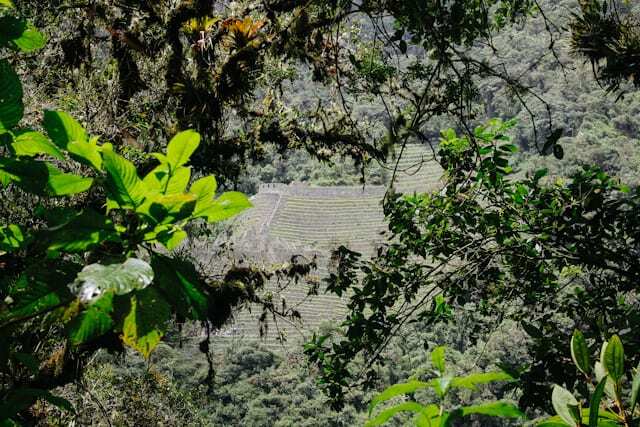 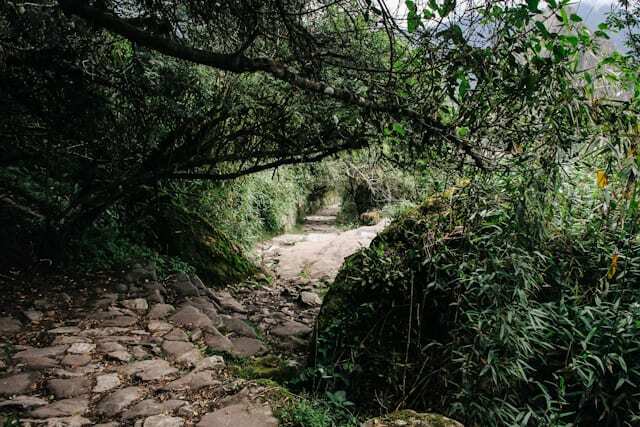 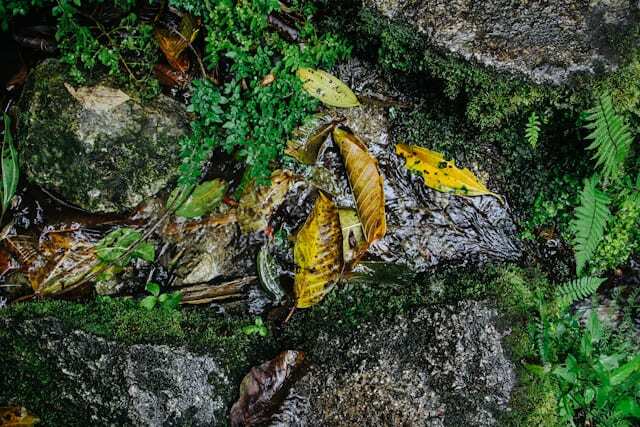 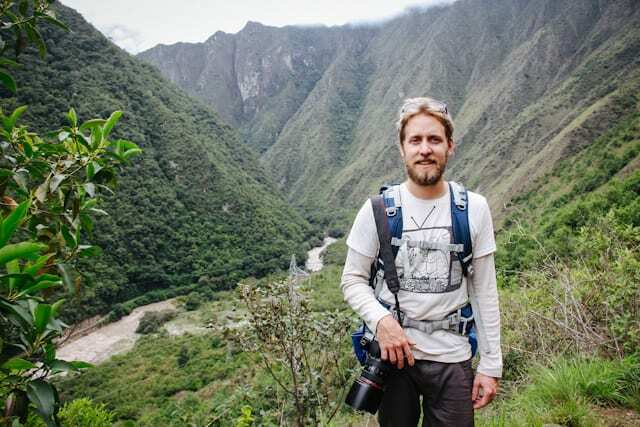 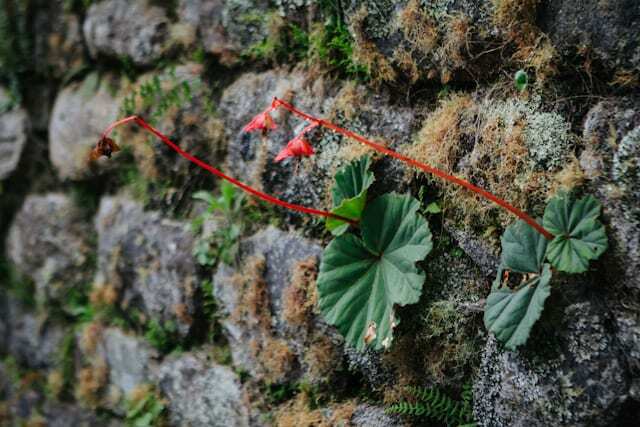 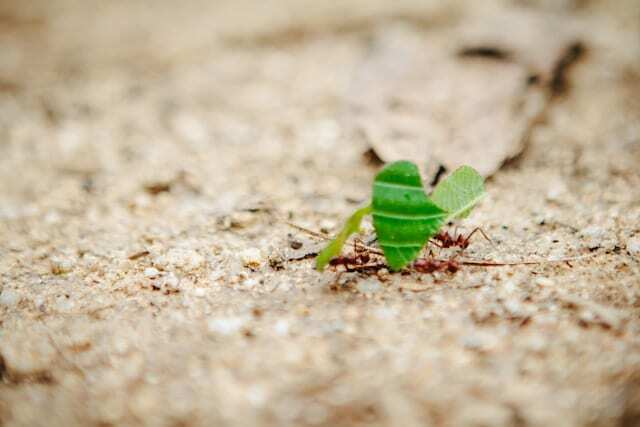 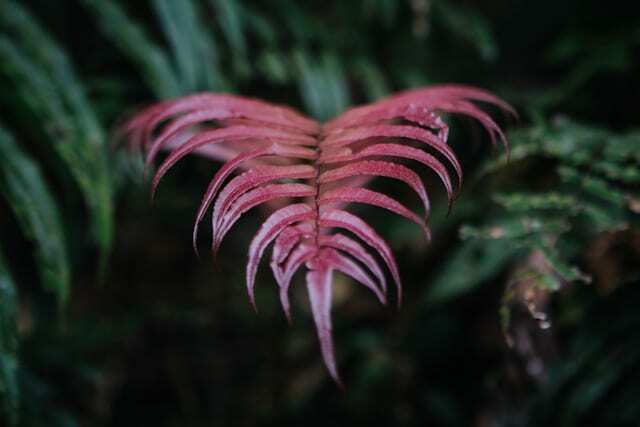 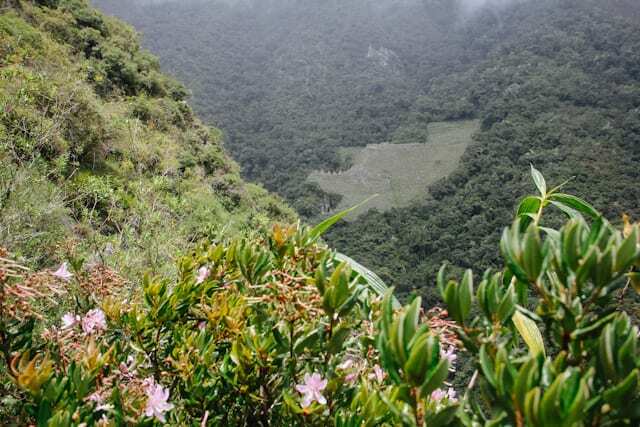 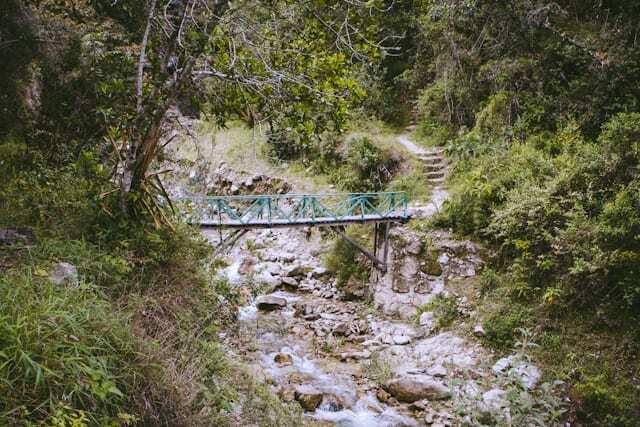 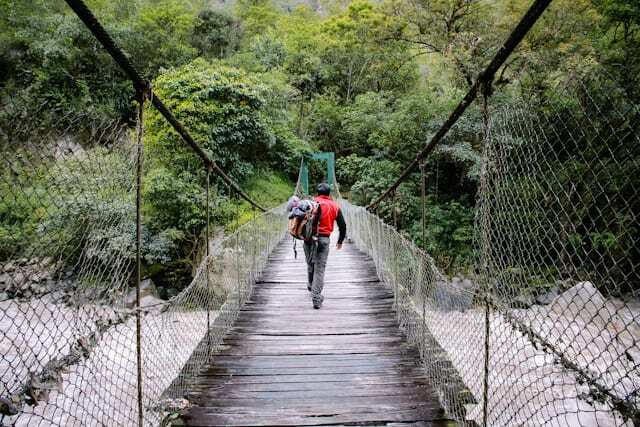 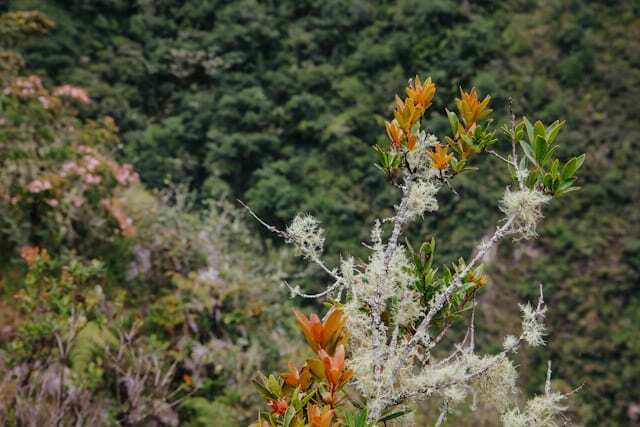 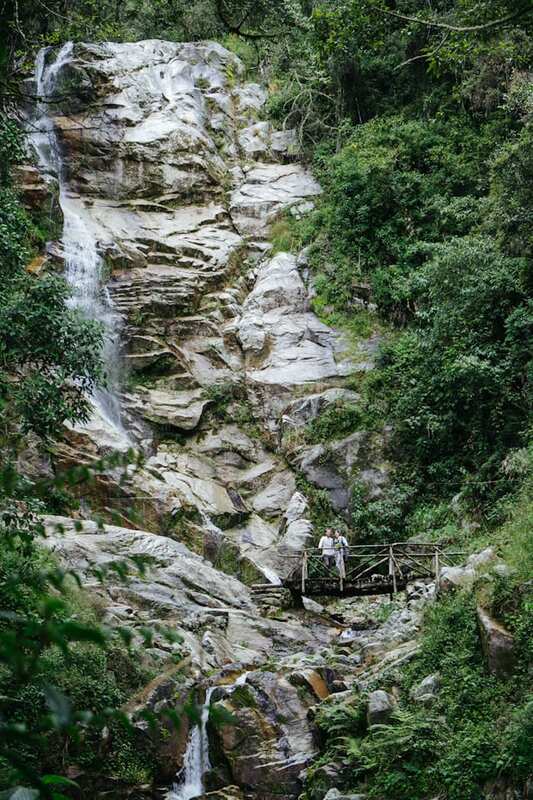 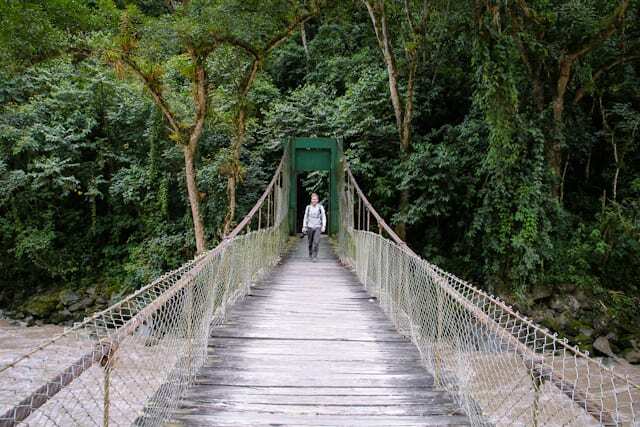 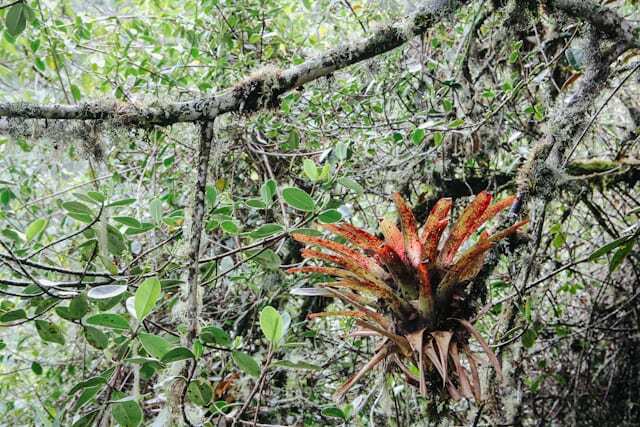 The Sacred Valley is on the edge of the Amazon so we often found ourselves walking through thick jungle like bush. 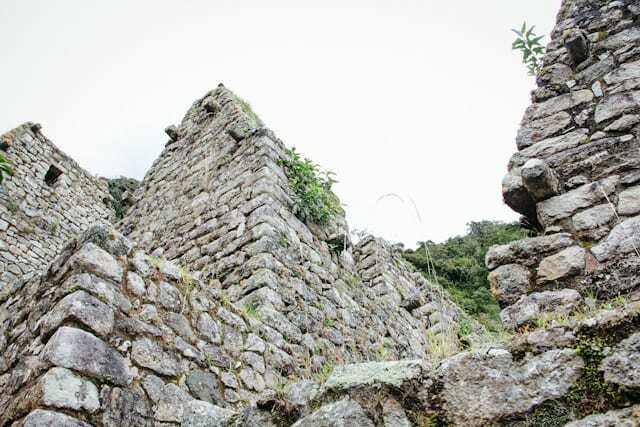 Our second ruins which took about 4/5 hours to get to. 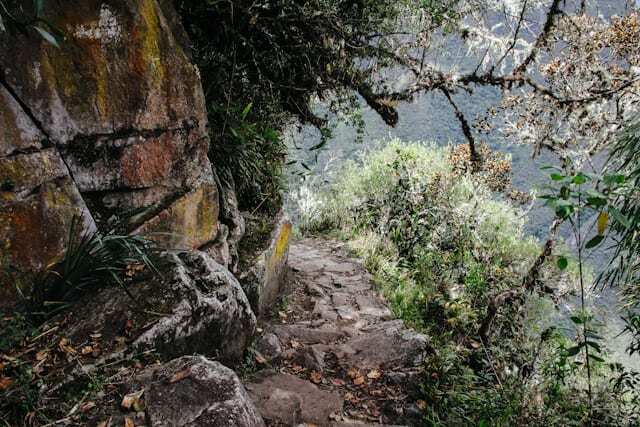 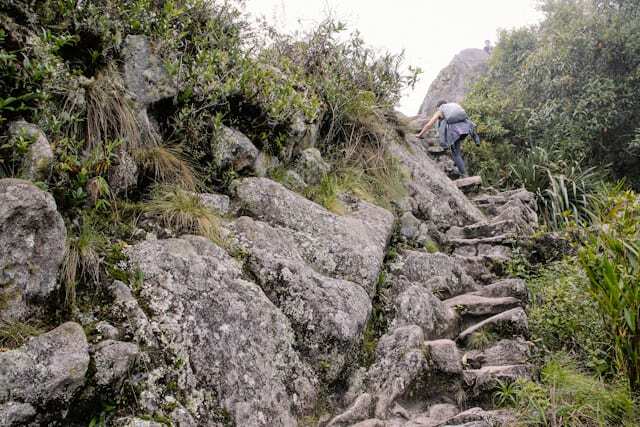 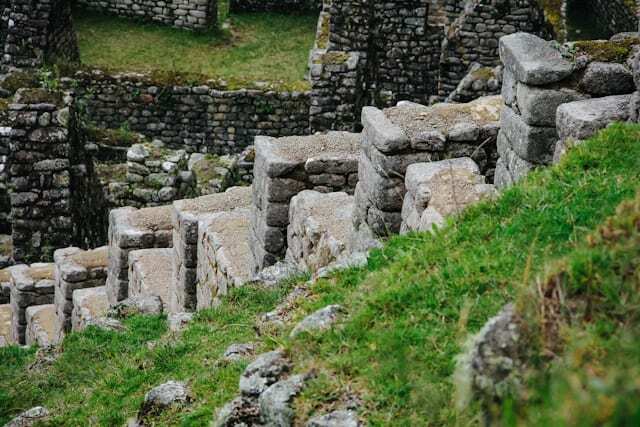 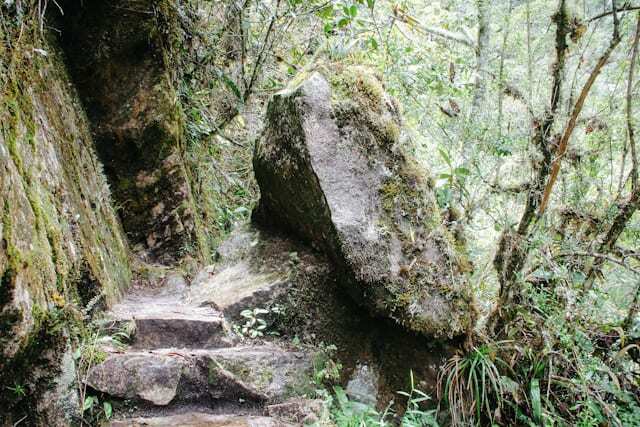 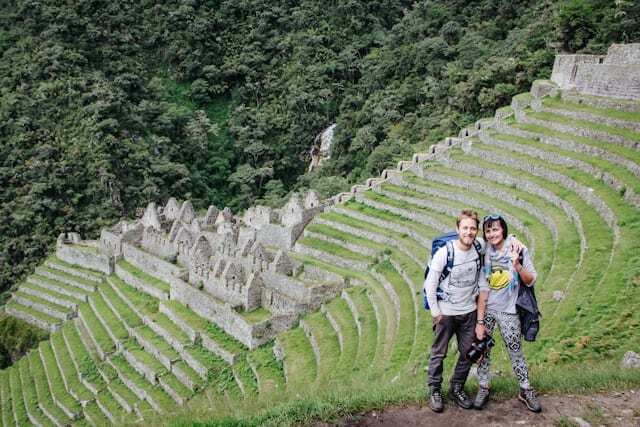 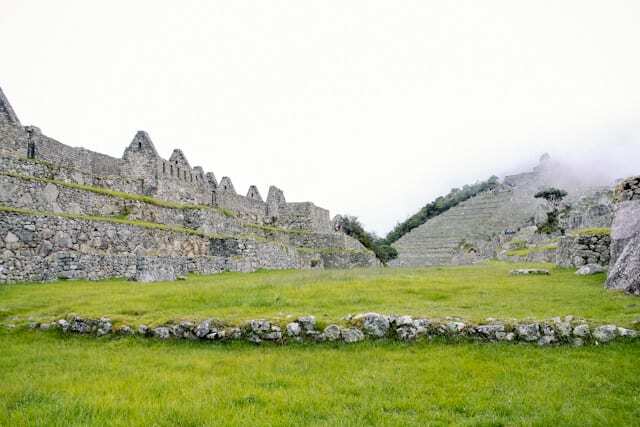 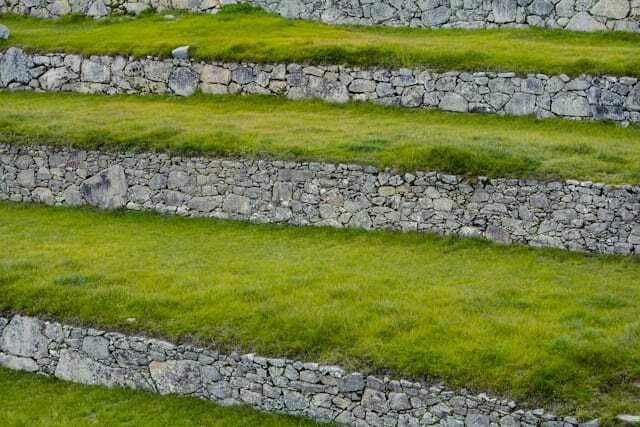 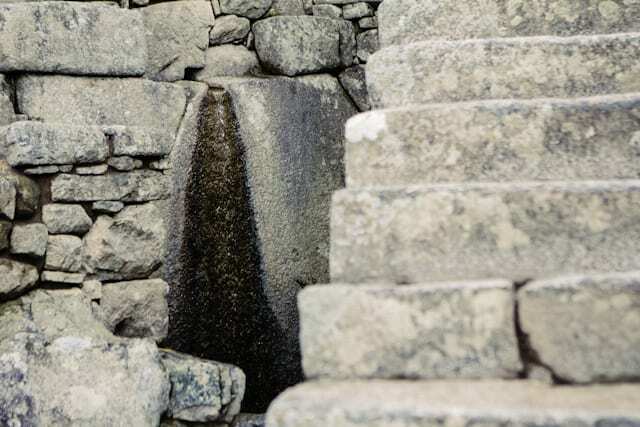 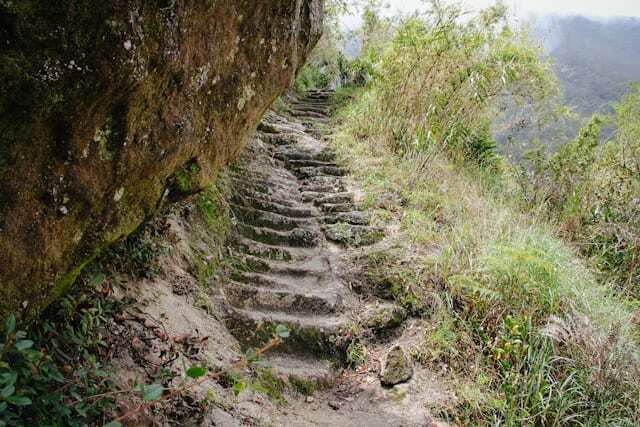 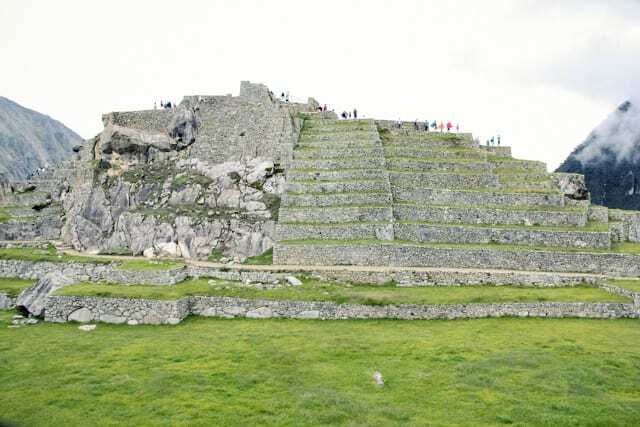 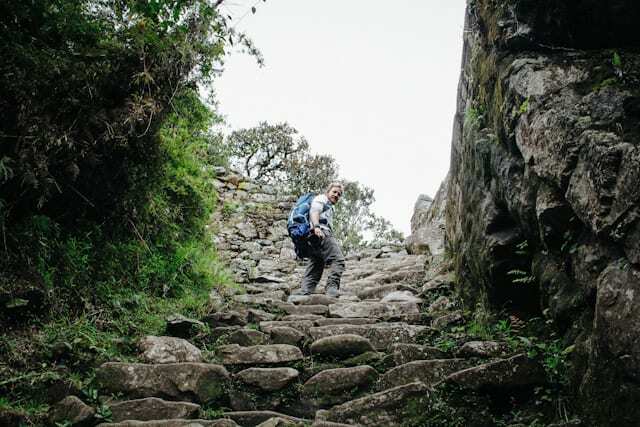 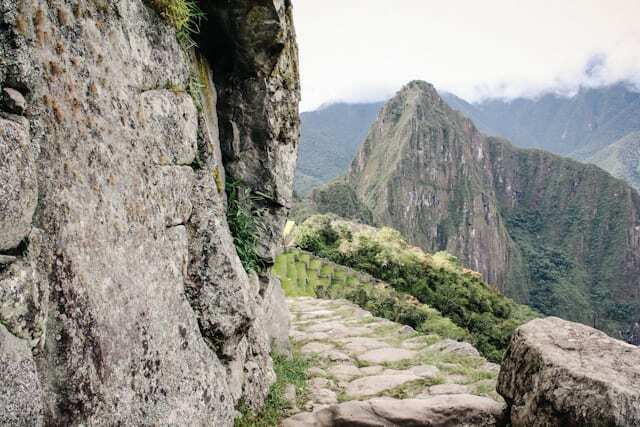 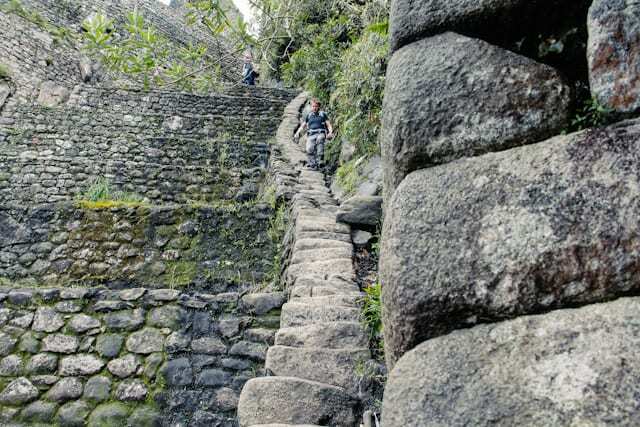 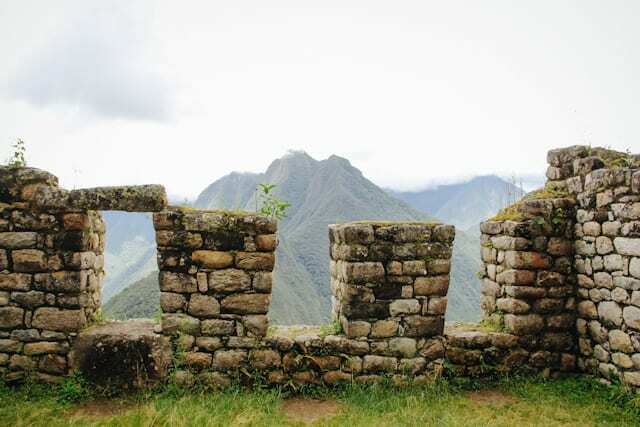 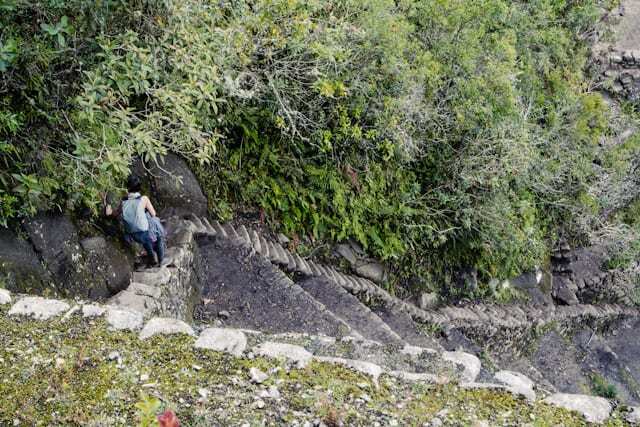 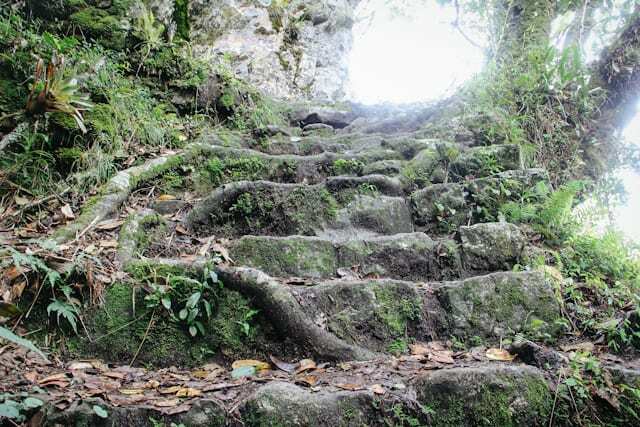 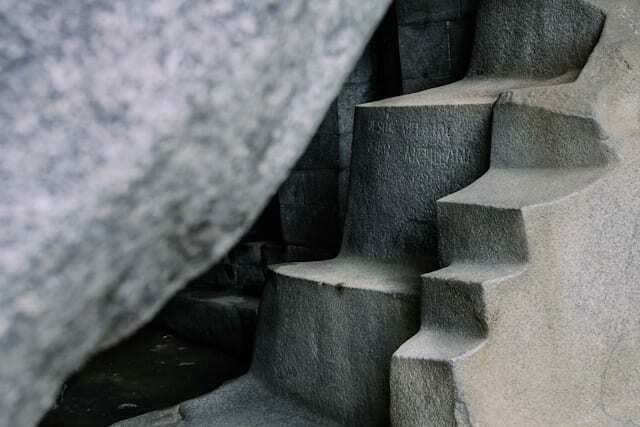 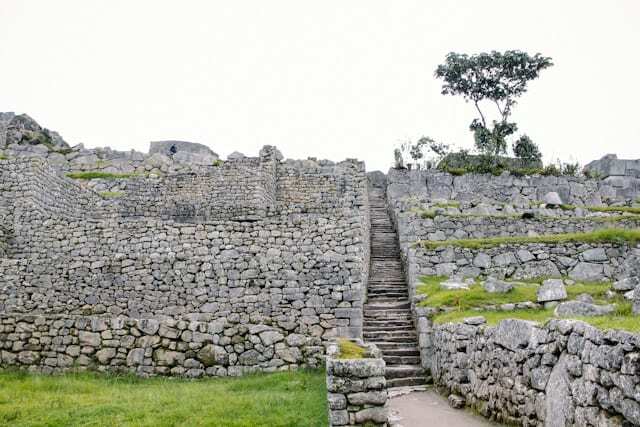 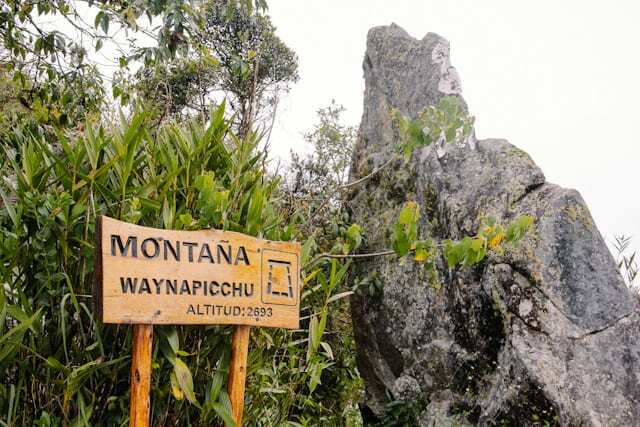 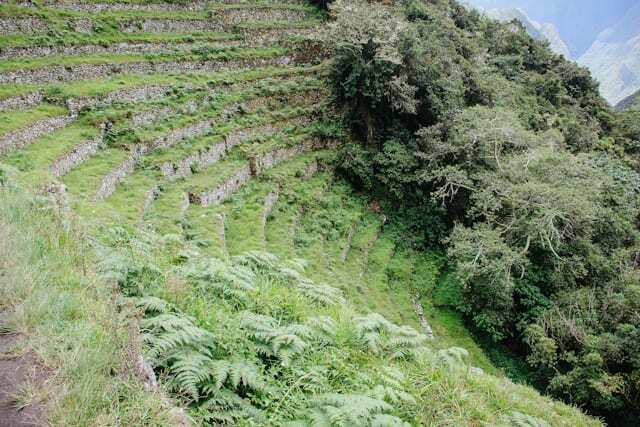 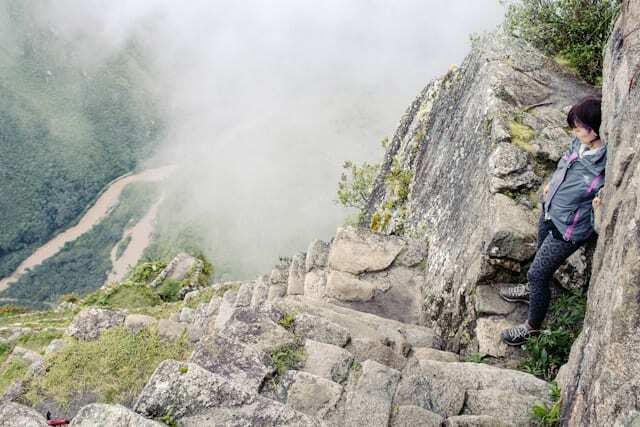 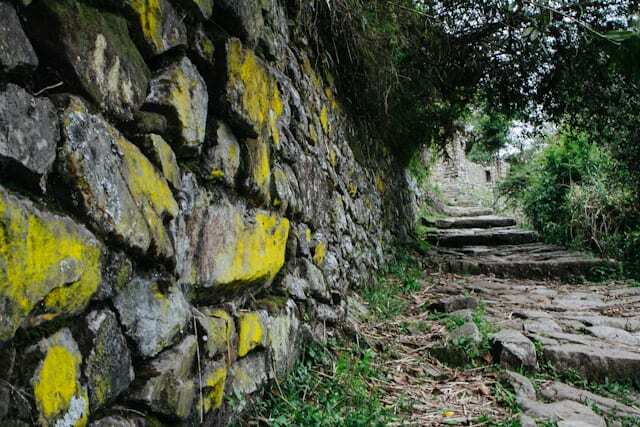 Up these stairs is the Intipunku, the view point from which you can see Macchu Picchu. 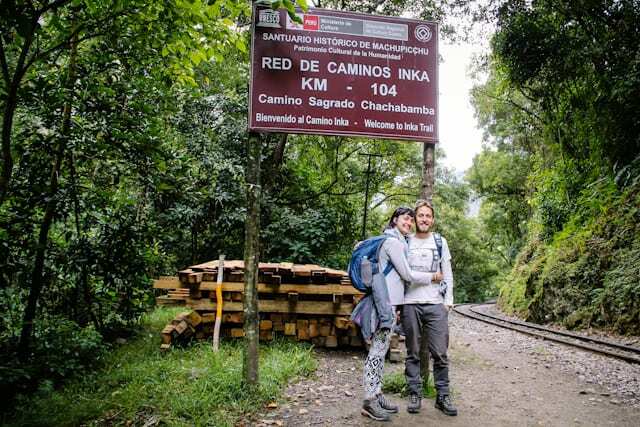 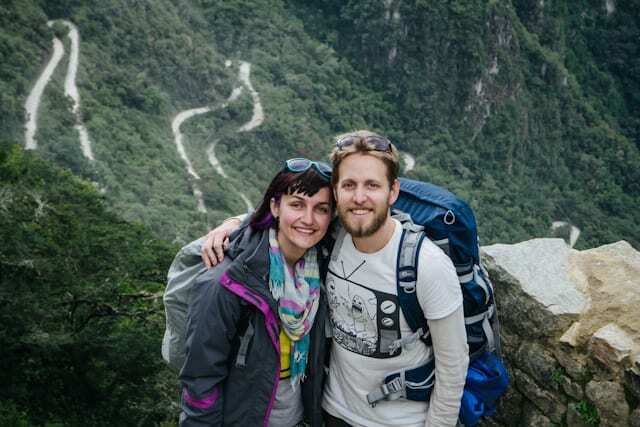 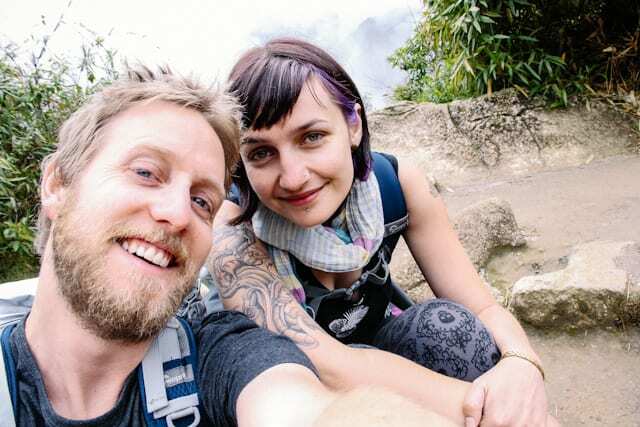 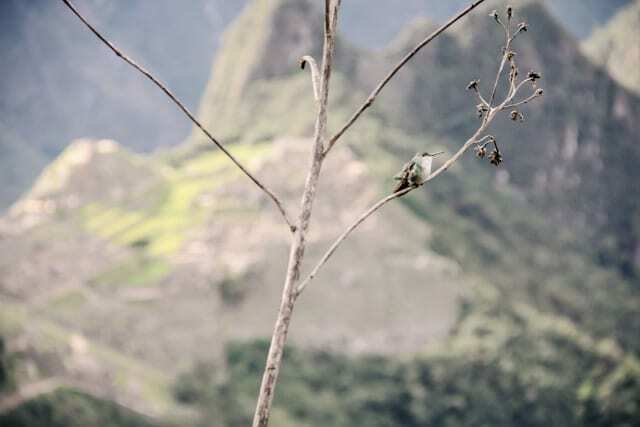 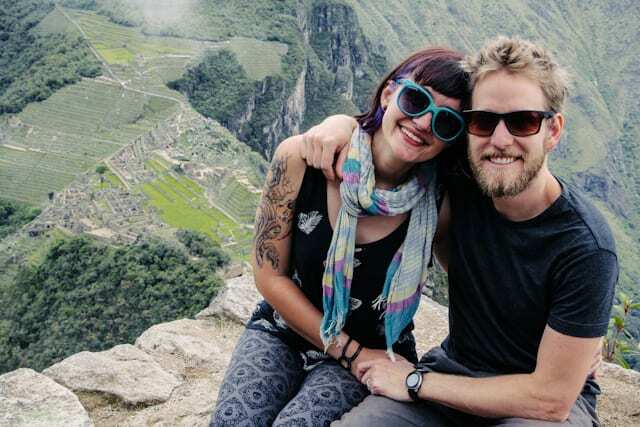 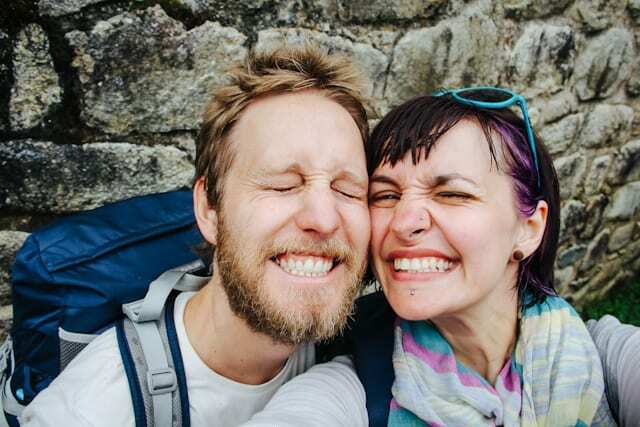 The snake like eye sore behind us is the road which leads up the mountain from Aguas Calientes to Macchu Piccu. 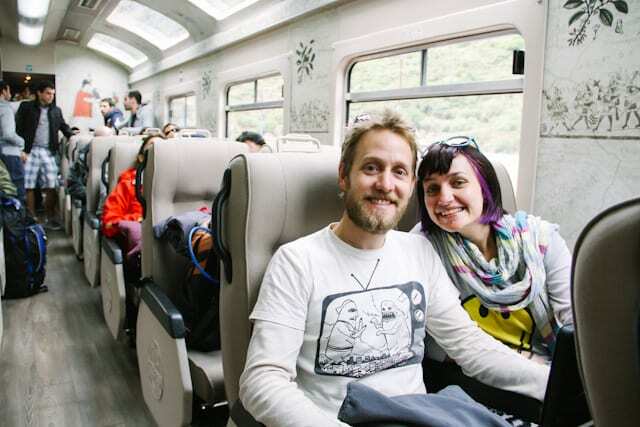 It is disgustingly expensive to travel by, but is definitely the easiest way! 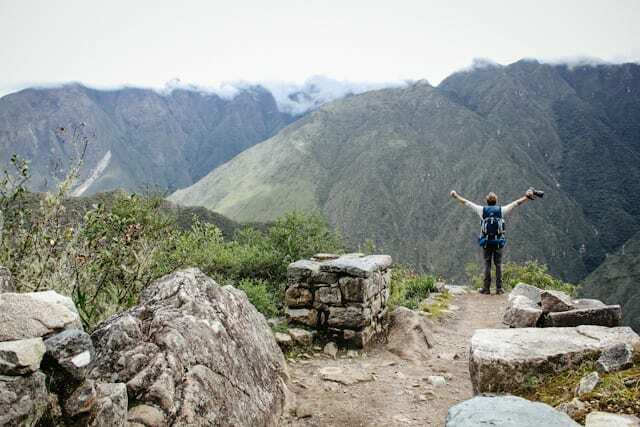 The sun came out just as we started making our way down to Macchu Picchu which is so lucky as apparently the weather is either beautiful and clear or terrible and misty. 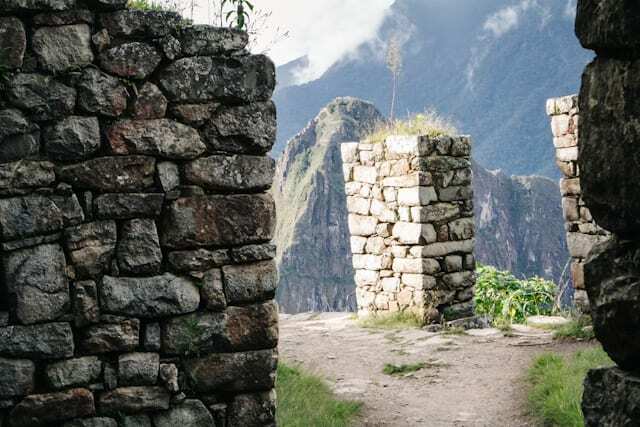 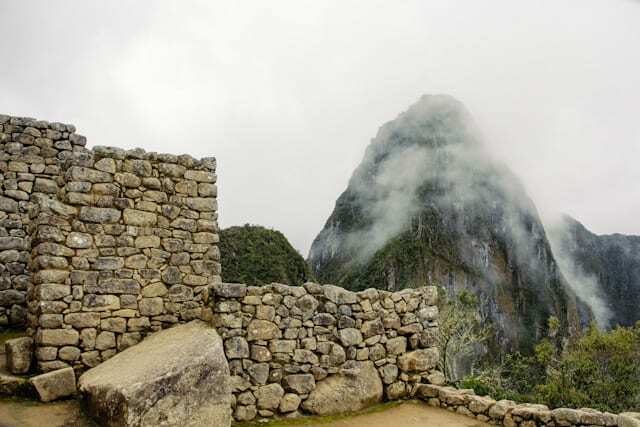 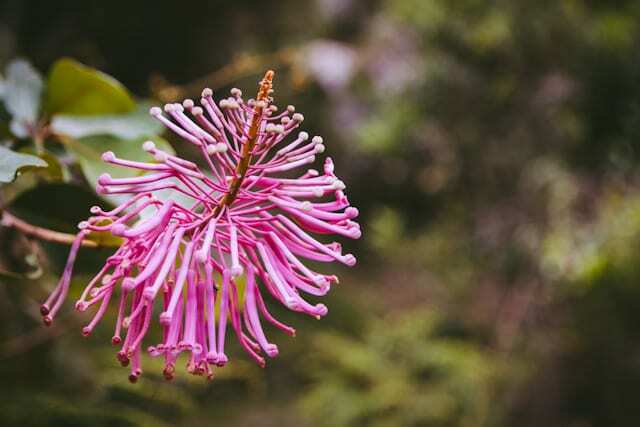 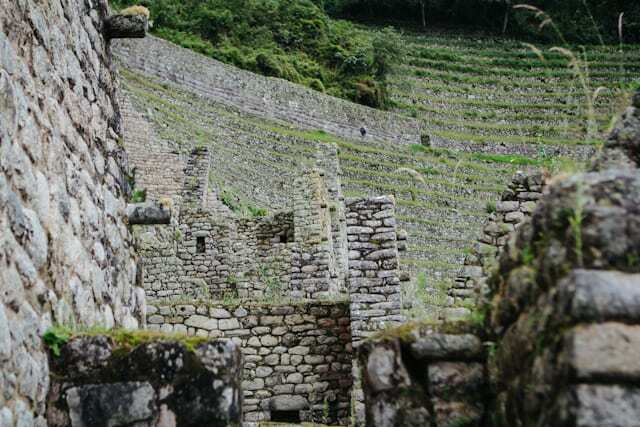 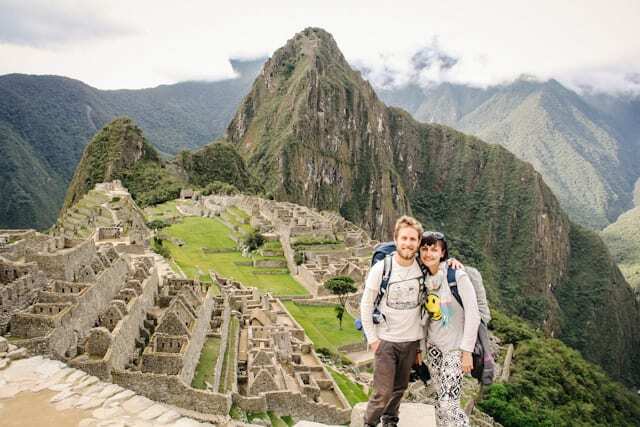 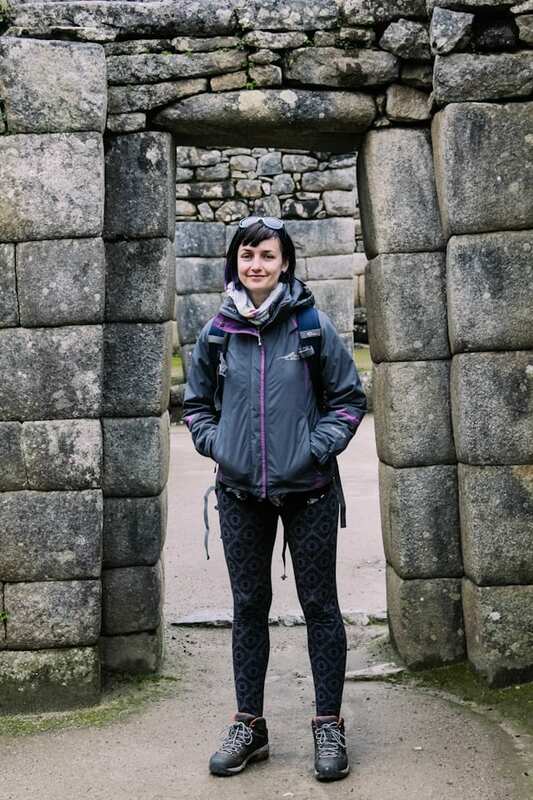 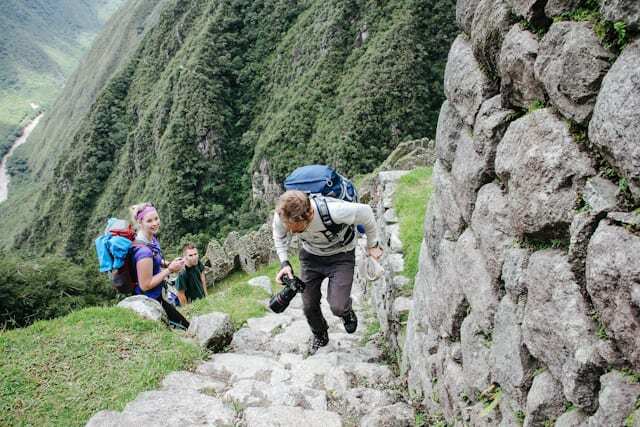 We were lucky enough to experience both as we spent two days exploring Macchu Picchu. 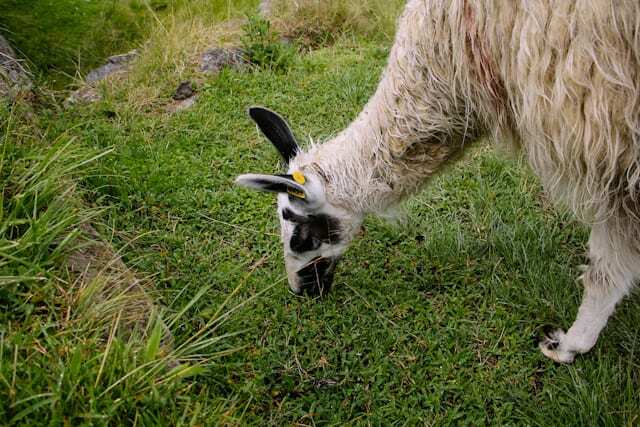 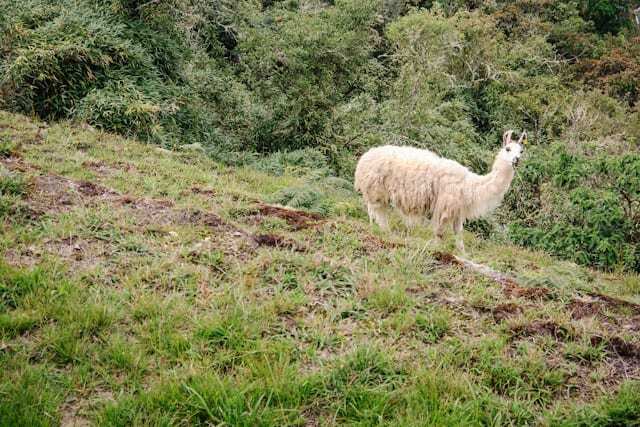 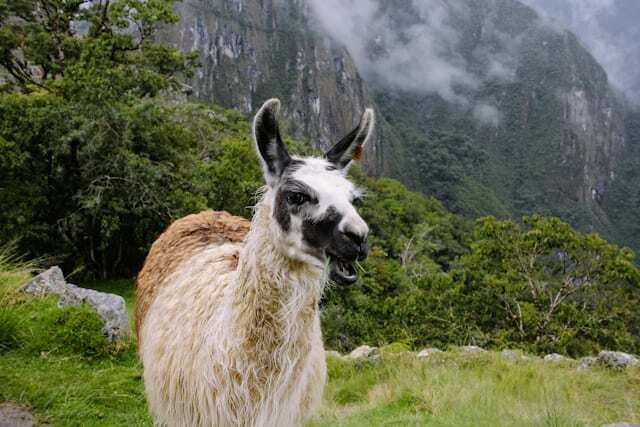 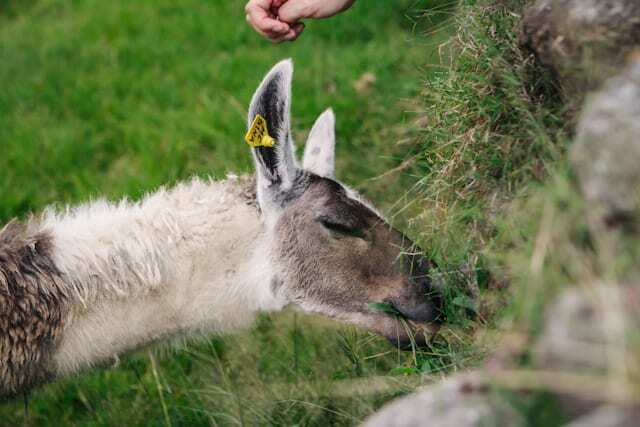 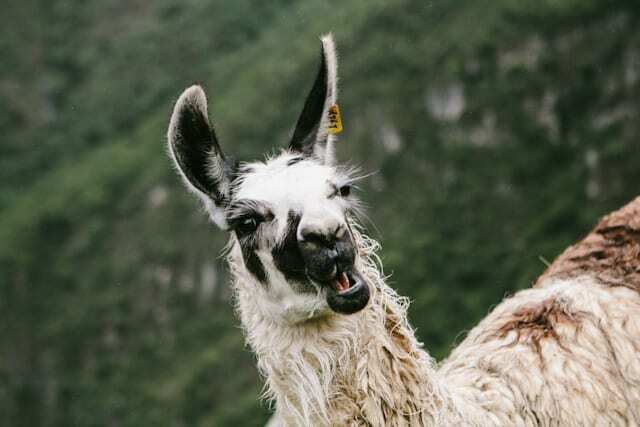 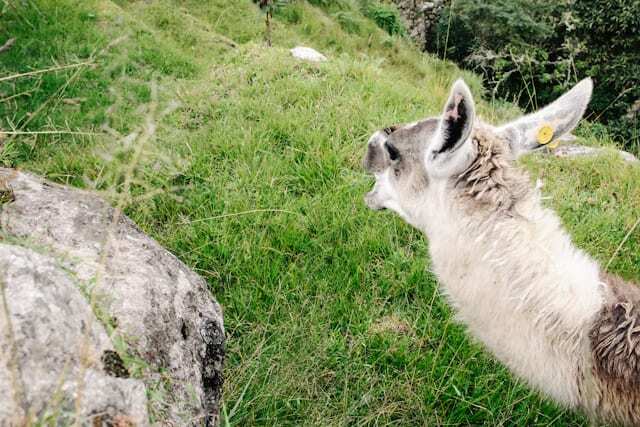 One of Macchu Picchu’s resident Llamas having a little snack. 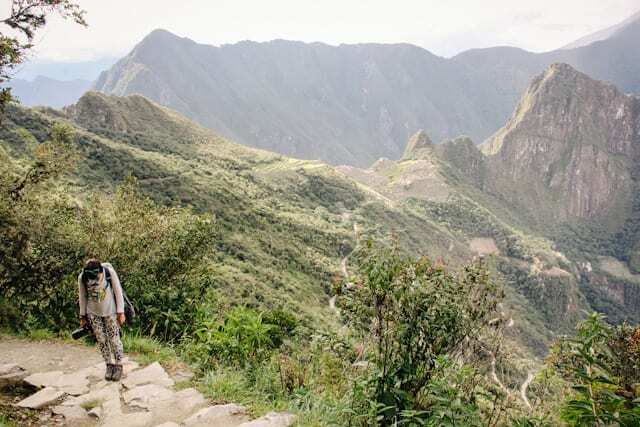 Our awesome guide Marcelino and us. 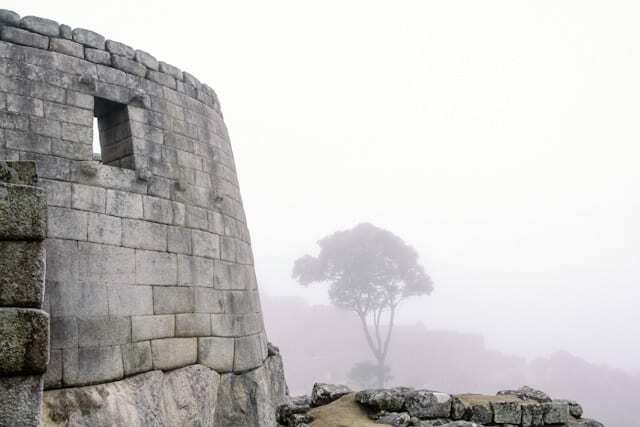 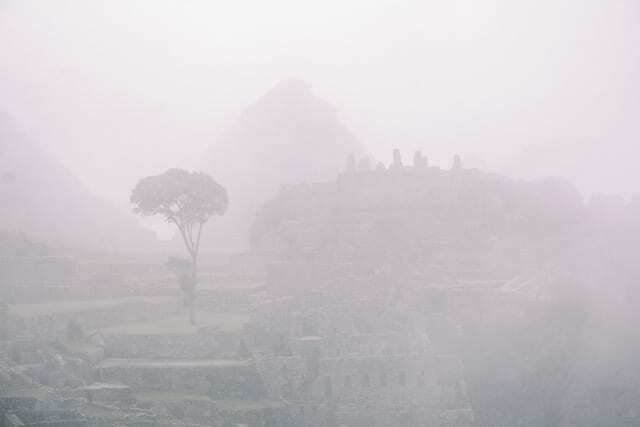 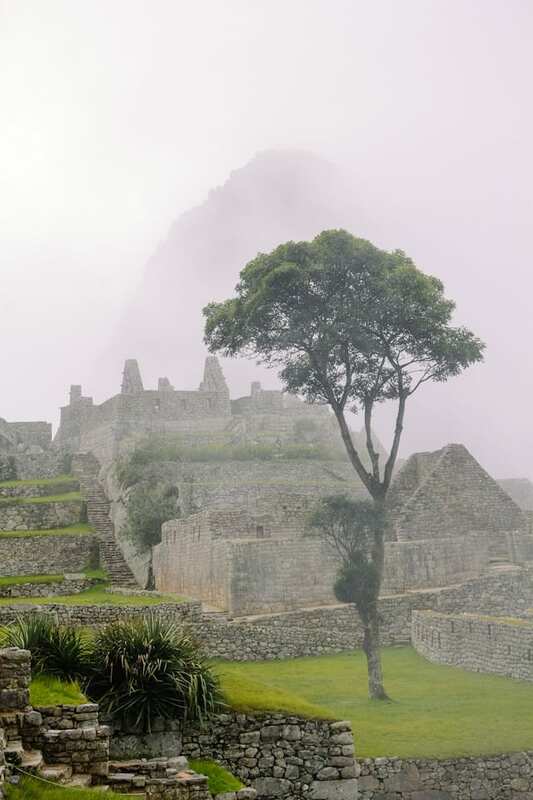 When we arrived at Macchu Picchu the next morning it had been transformed into a misty wonderland which was just magical to see! 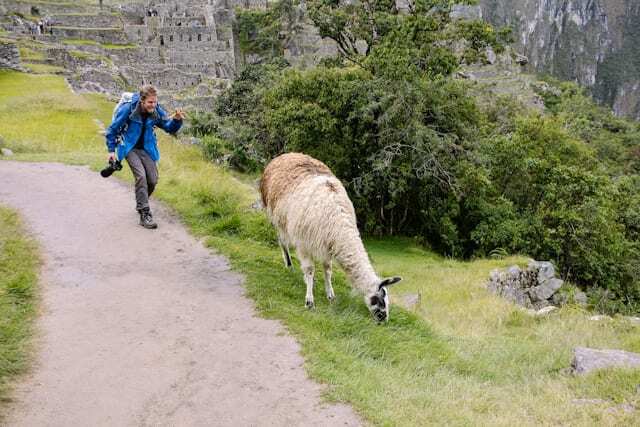 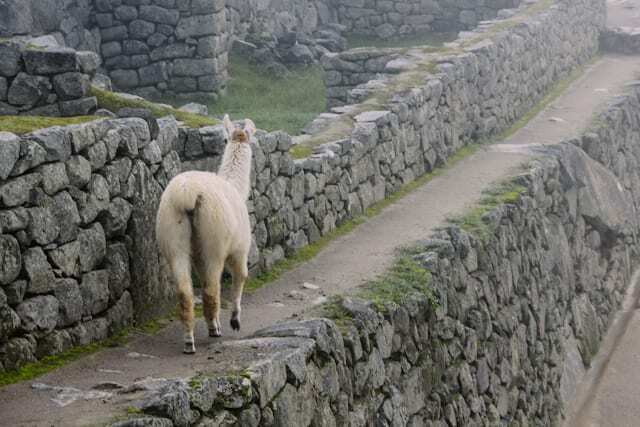 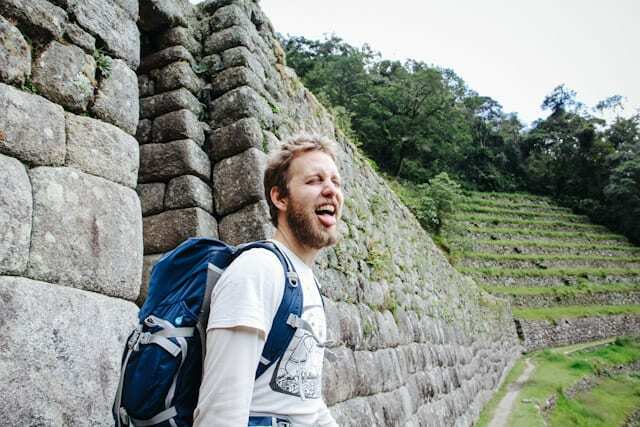 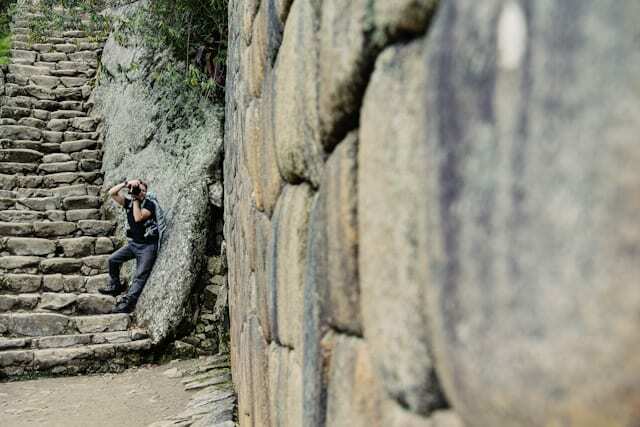 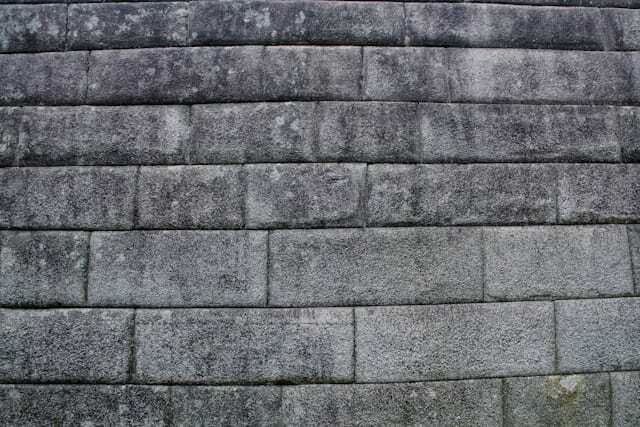 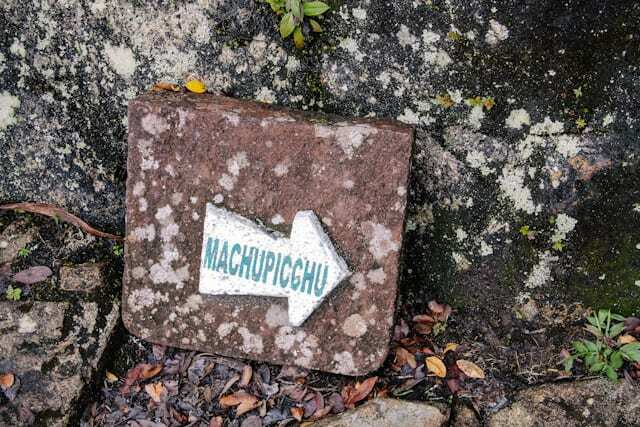 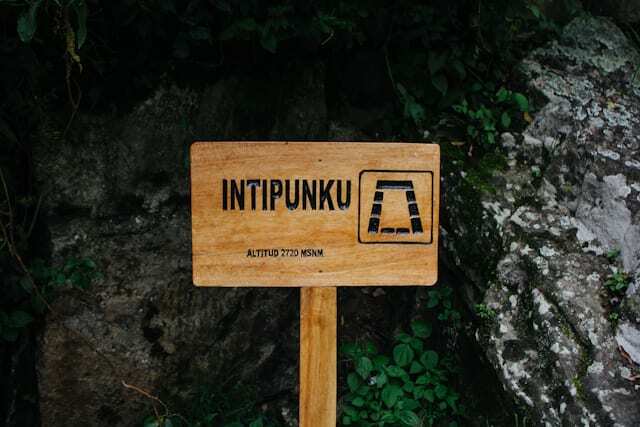 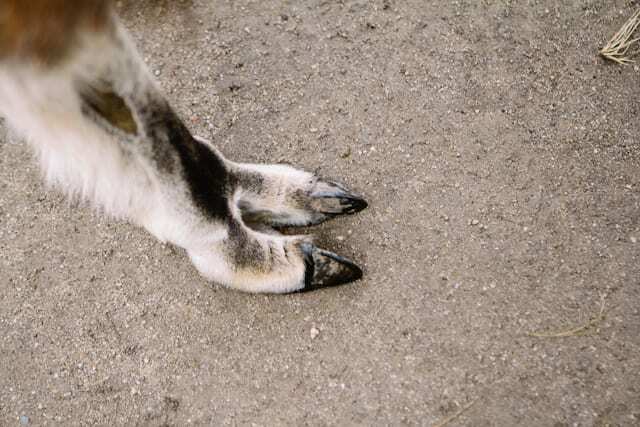 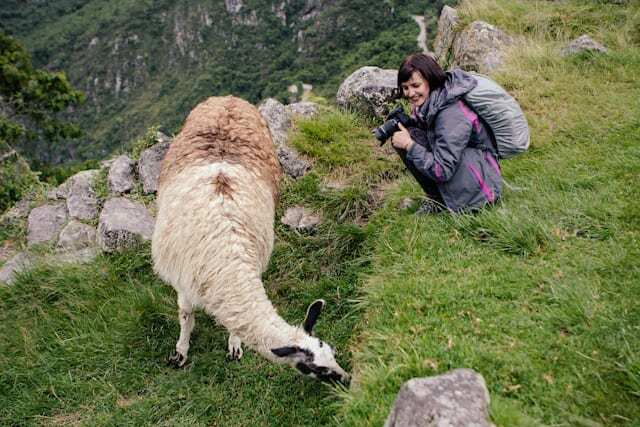 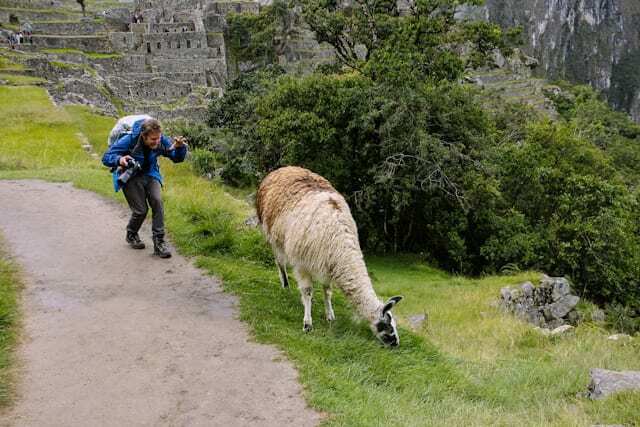 As many tourists come to Macchu Picchu on a half day tour, this is the only way many people saw it. 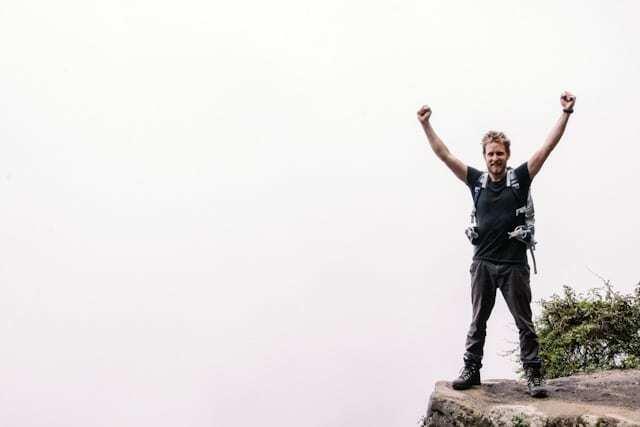 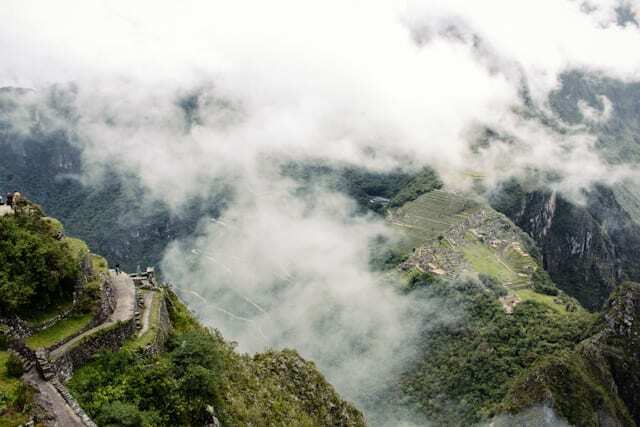 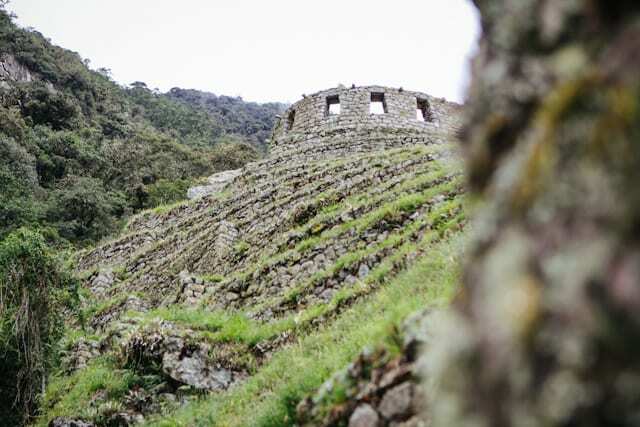 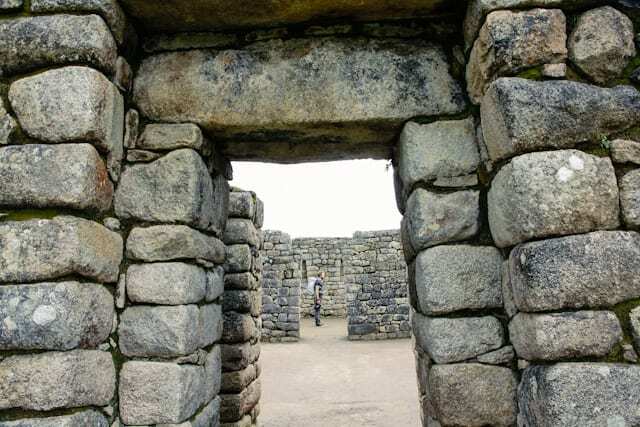 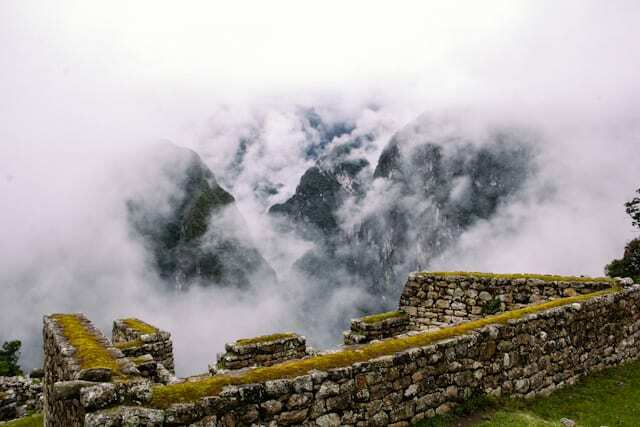 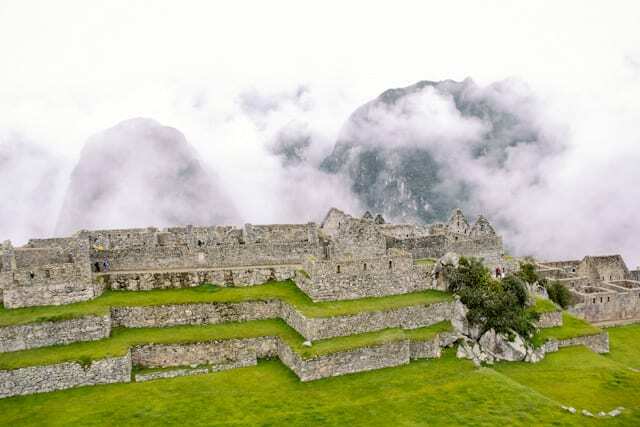 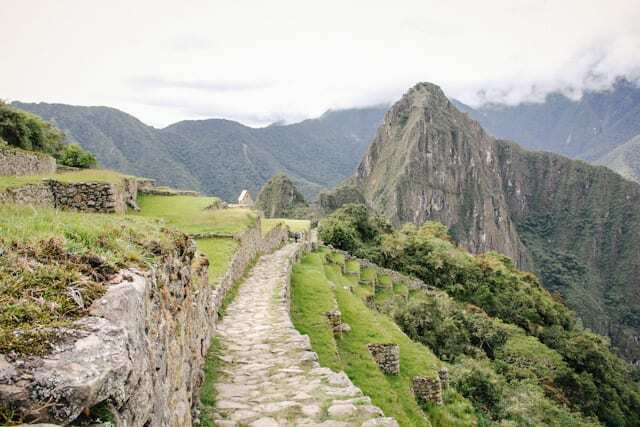 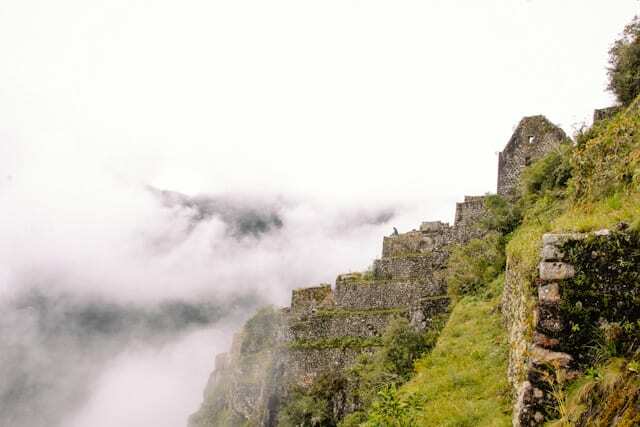 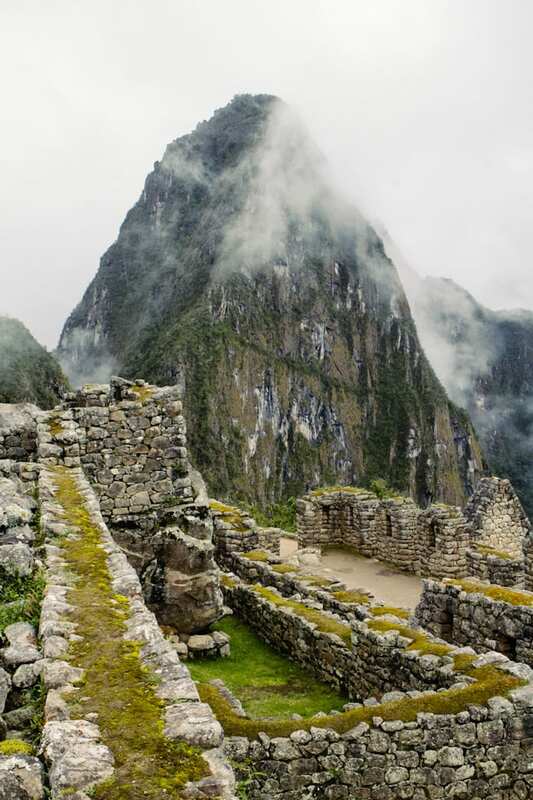 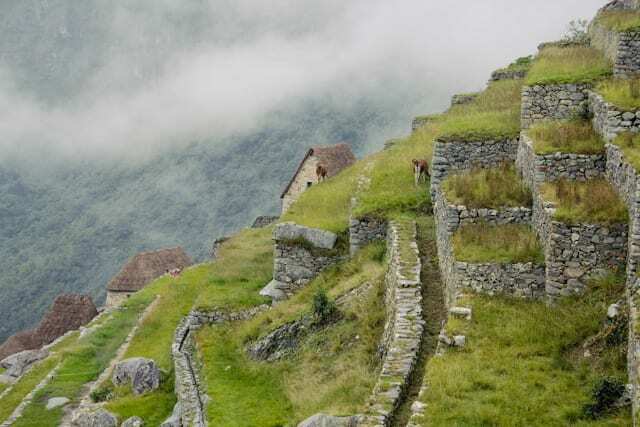 This is one of the main reasons that when we travel to somewhere as incredible as Macchu Picchu we like to have a couple days there to fully be able to take it in, with all its varying weather conditions. 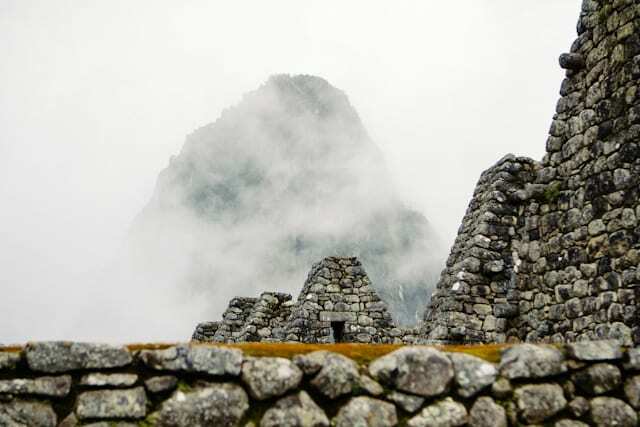 Misty Macchu Picchu had such an eery beauty to it and we feel so lucky to have seen it in both the ways the Incas who lived there would have experienced it! 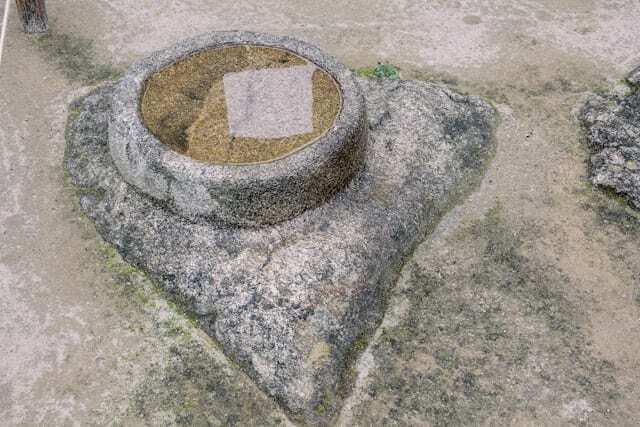 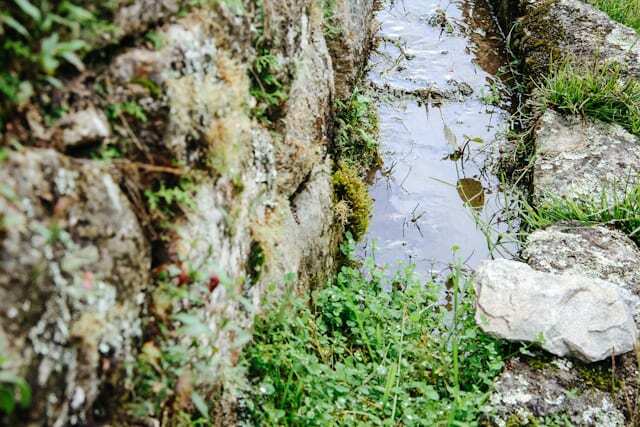 This amazing looking hole with water in it was used to examine the stars so people knew the best time to plant and harvest their crops. 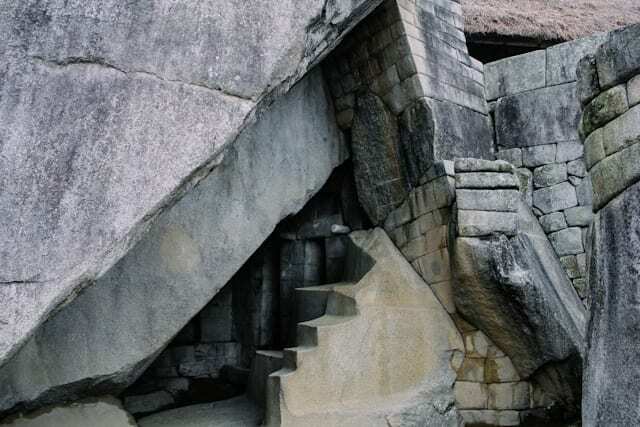 The stonework was mindlowing!Its hard to believe these rocks were all cut and put together as the workmanship is so fine. 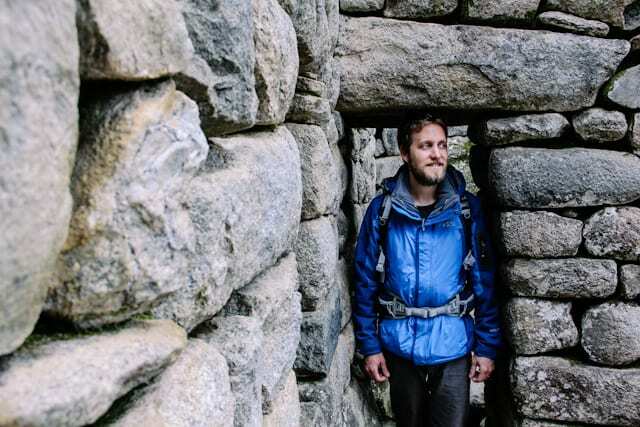 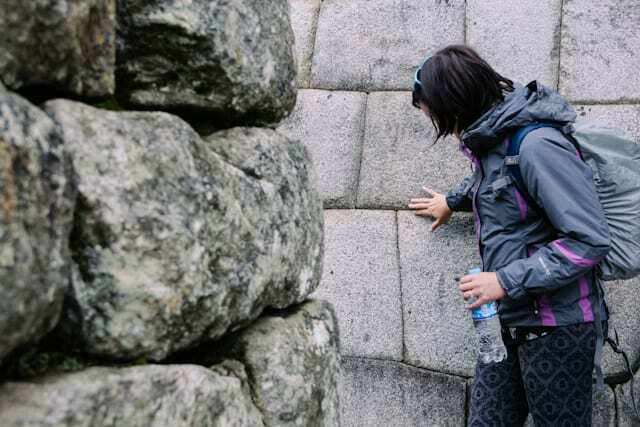 The Incas were pretty short judging from the height of their doorways and passages. 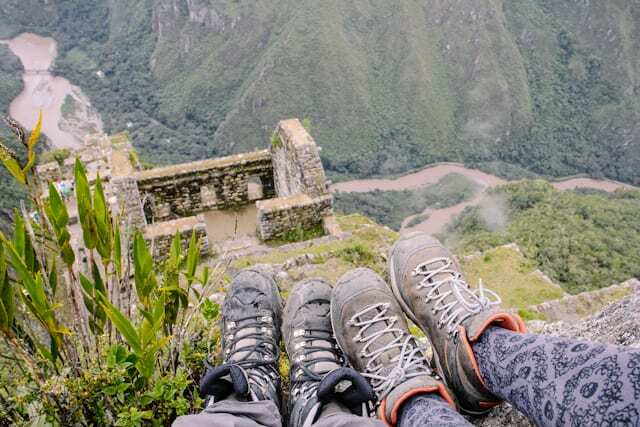 We decided to climb Wayna Picchu, the conical mountain you always see in the background of the eponymous Macchu Picchu shot. 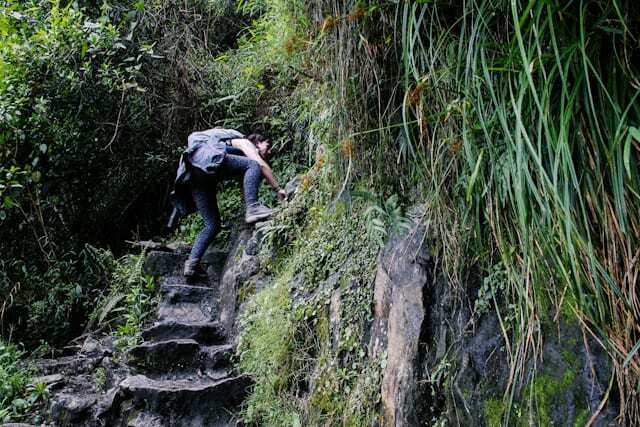 It was hectically steep, with places where you had to pull yourself up on all fours. 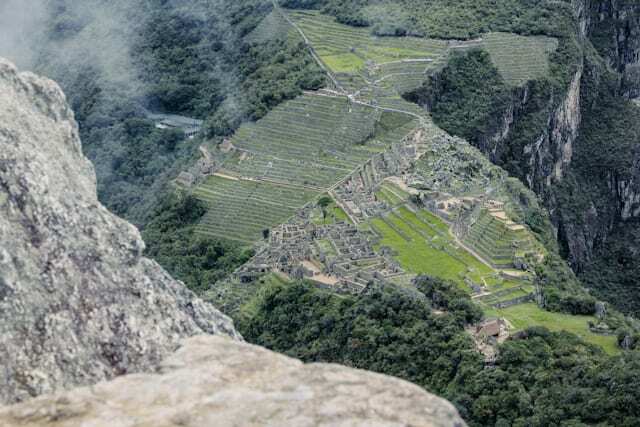 Only a certain number of people are allowed up a day and we made sure we booked our permits months in advance to make sure we would have the opportunity to climb up. 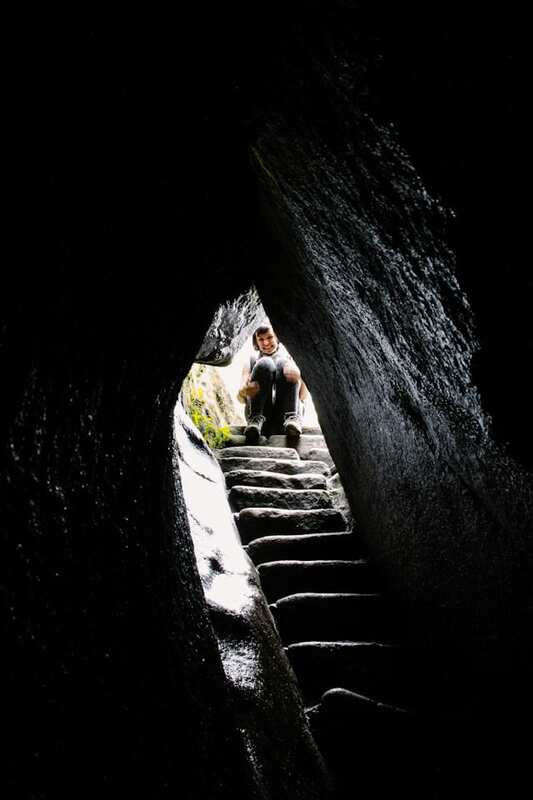 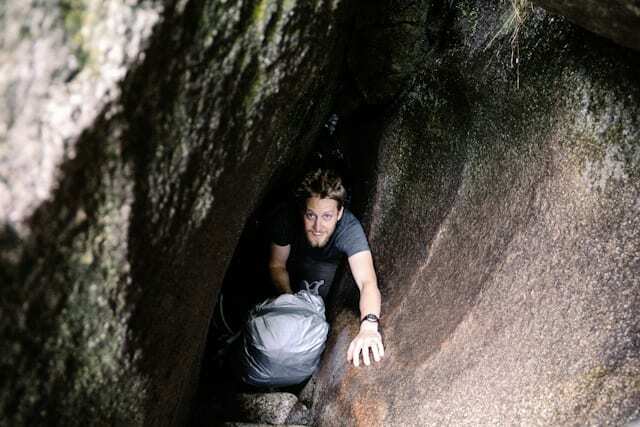 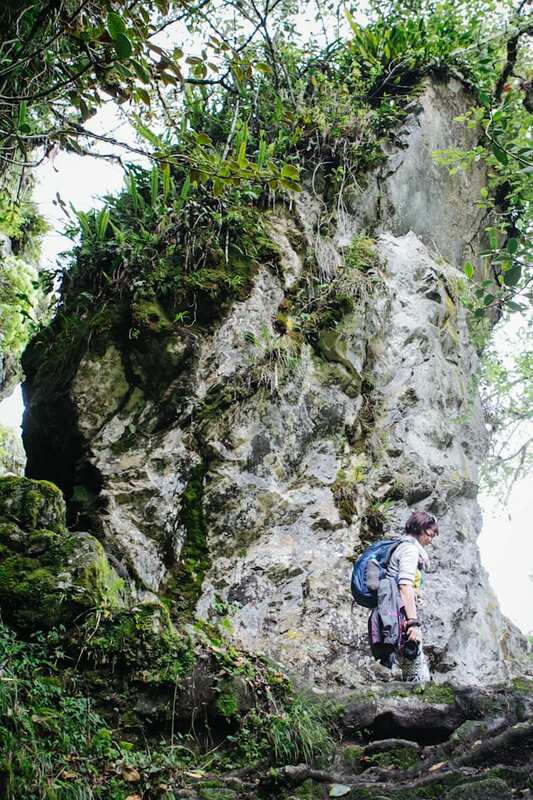 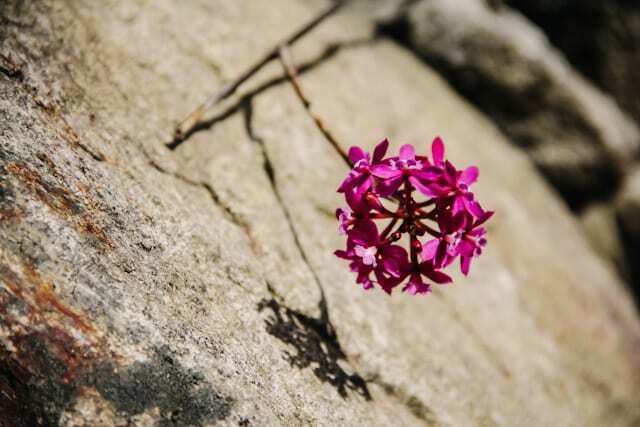 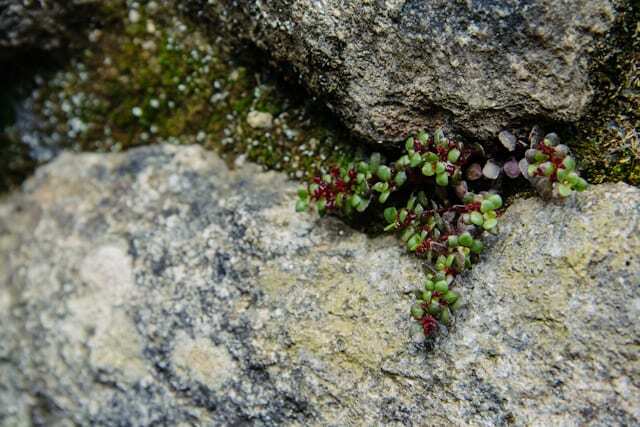 To get towards the top you have to climb through a pretty narrow cave which is NOT advised for the claustrophobic! 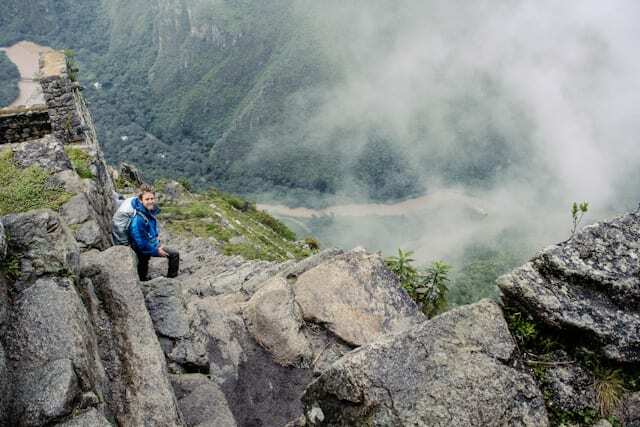 The mist initially obstructed our view of Macchu Picchu, which is the main point of the walk up, but we were really lucky to have it clear up for like 5 minutes so we could see the view below. 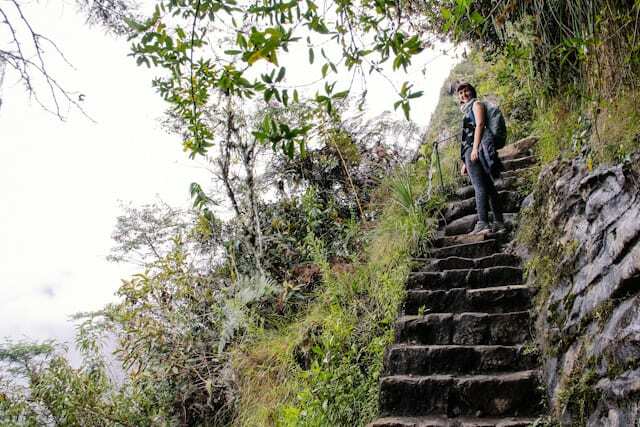 The stairs down were hella steep and wet, which made for a slow trip down! 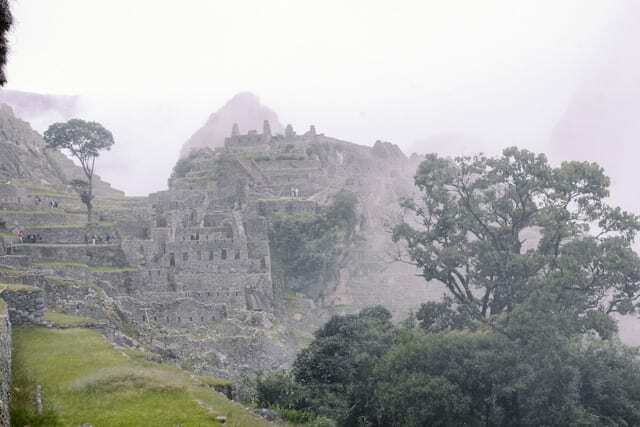 The few tourists you see dotted on top here is a minute fraction of the hoardes that were pretty much EVERYWHERE, ALL the time! 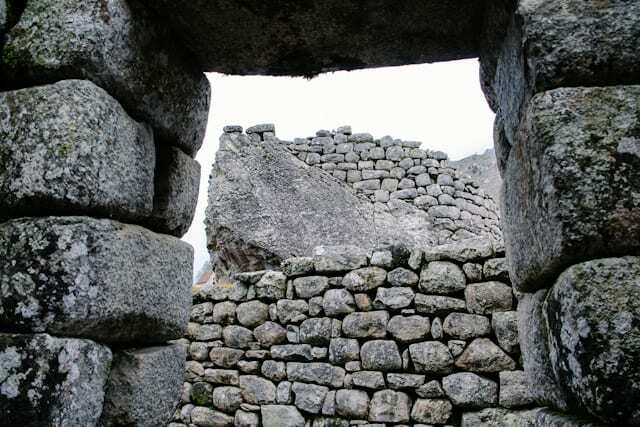 We waited for ages often to get shots of the cool architecture without clumps of Americans and Japanese everywhere! 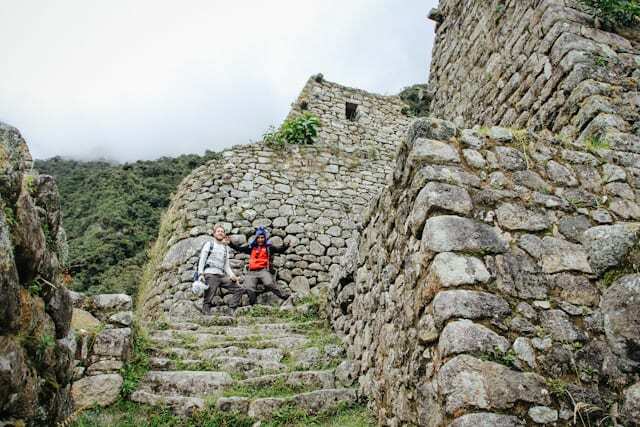 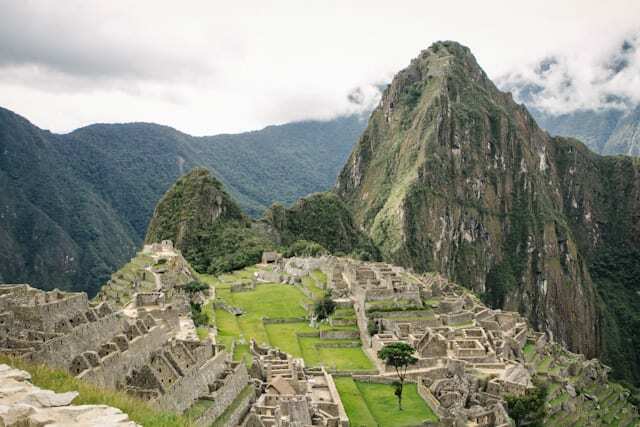 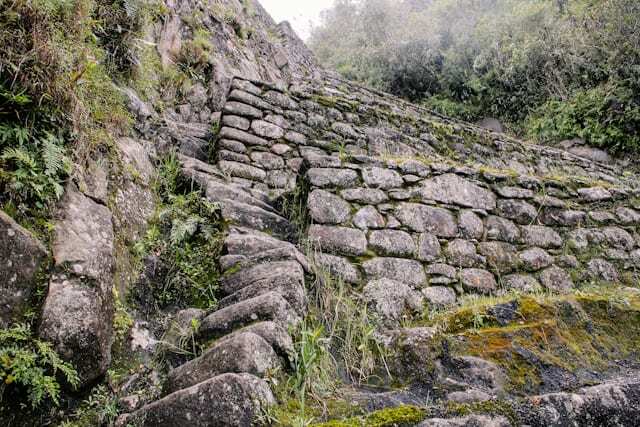 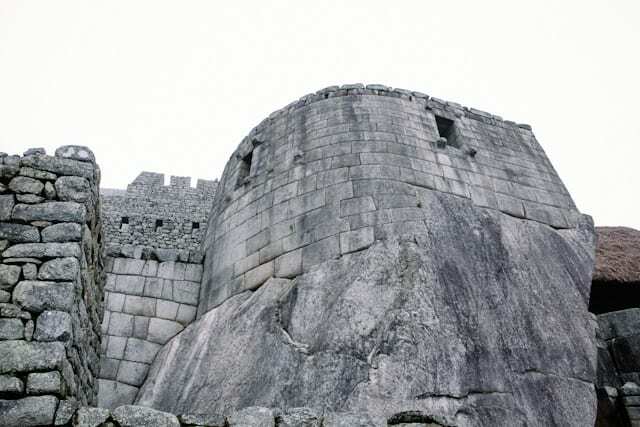 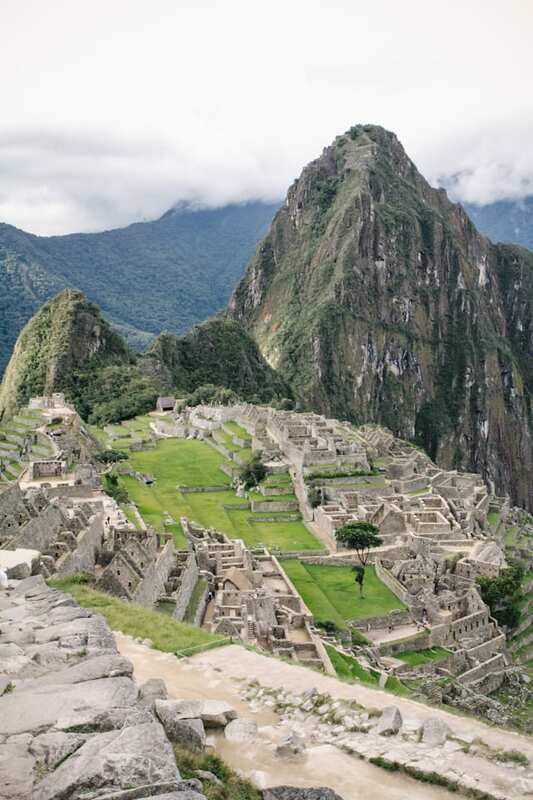 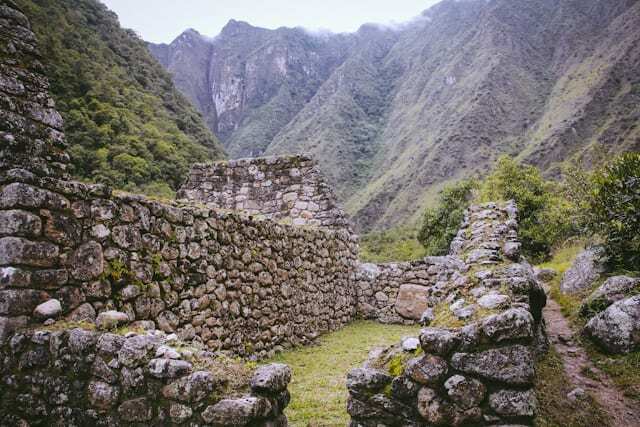 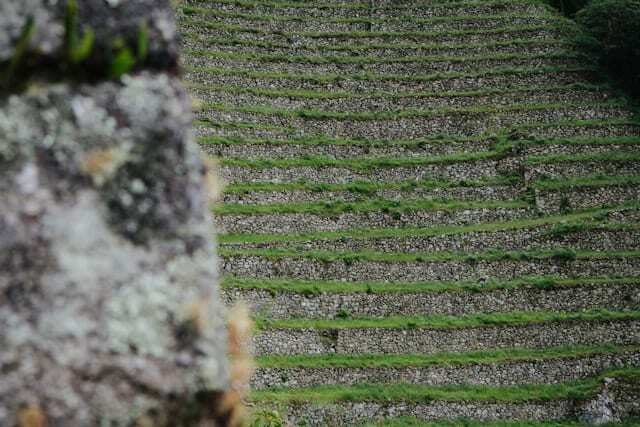 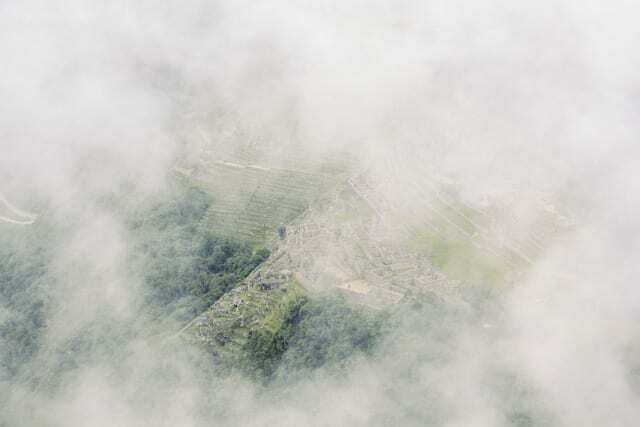 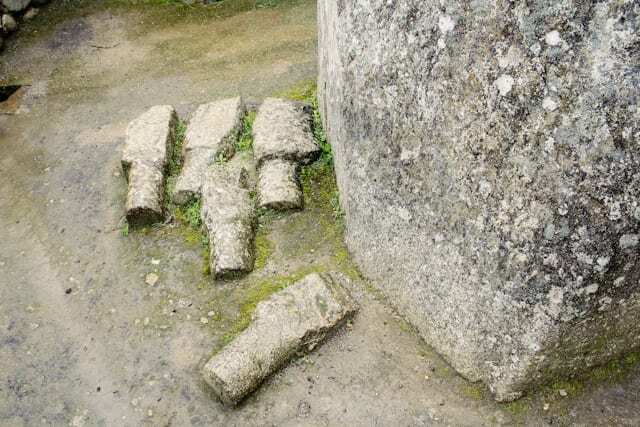 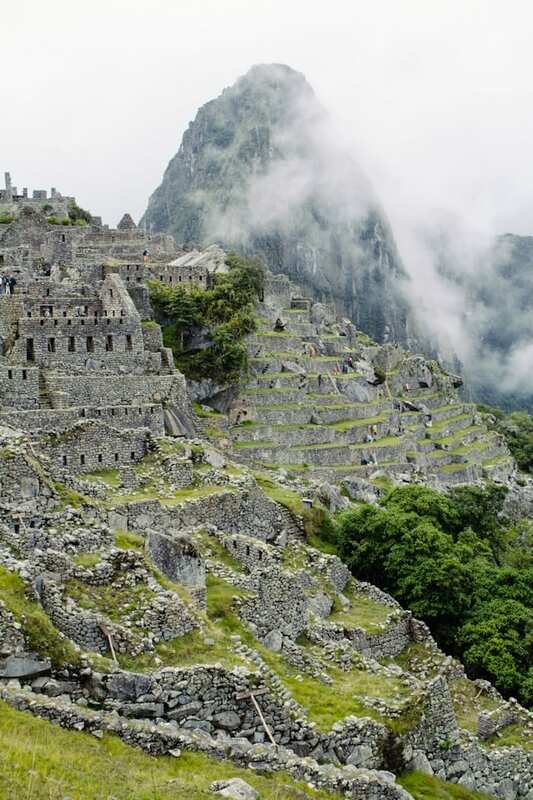 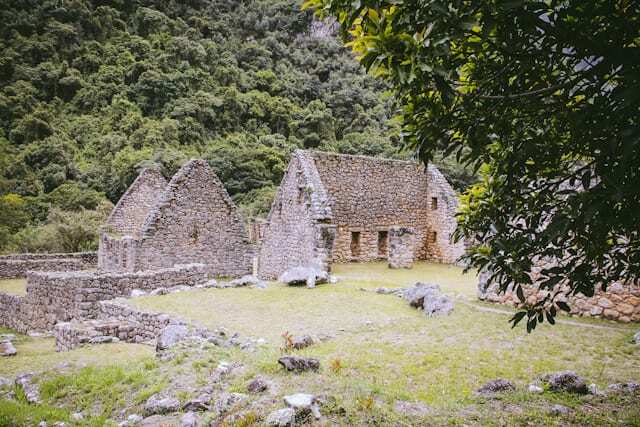 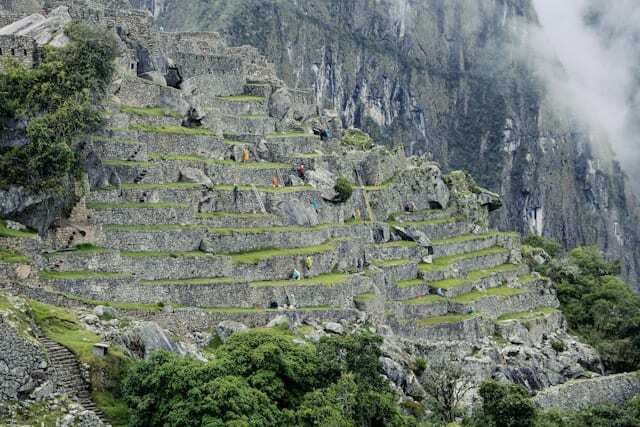 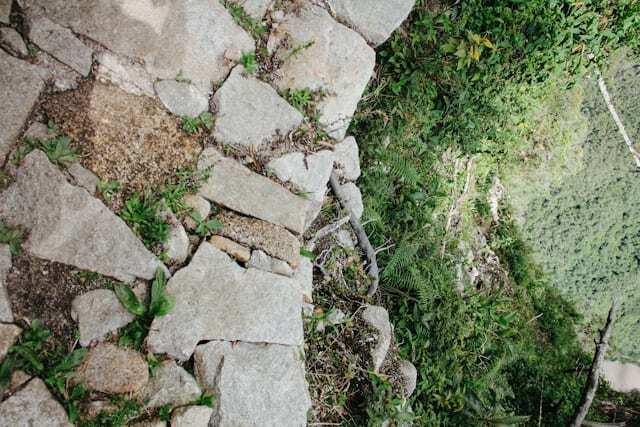 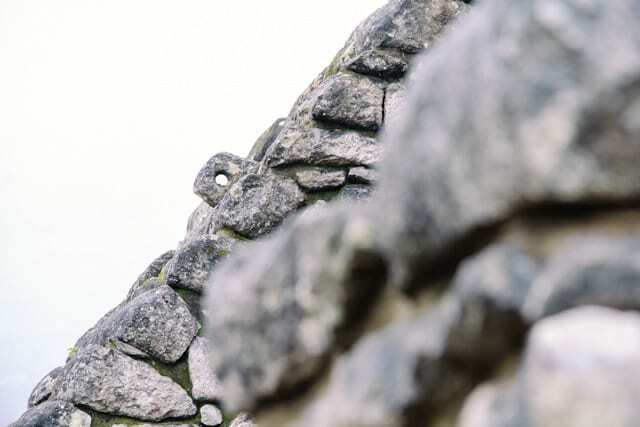 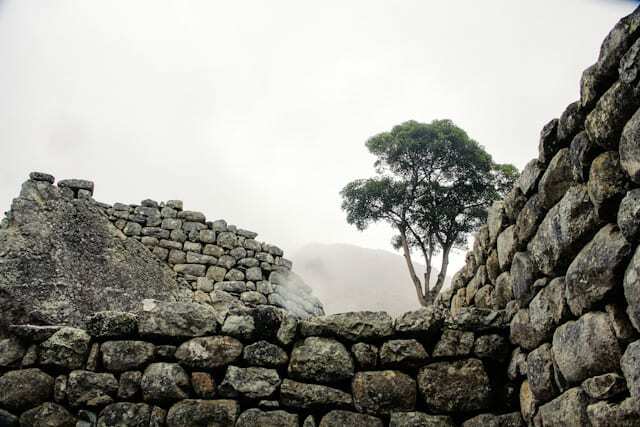 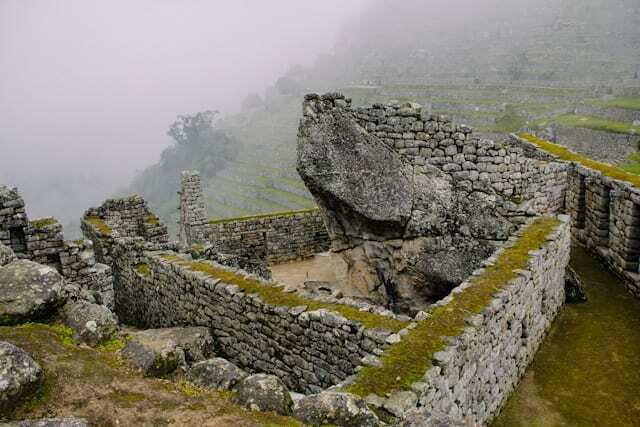 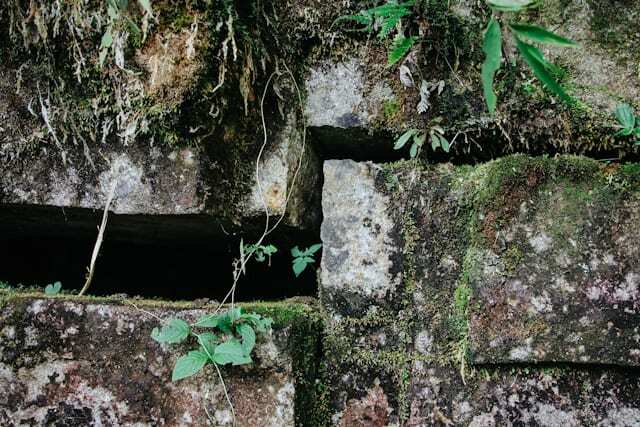 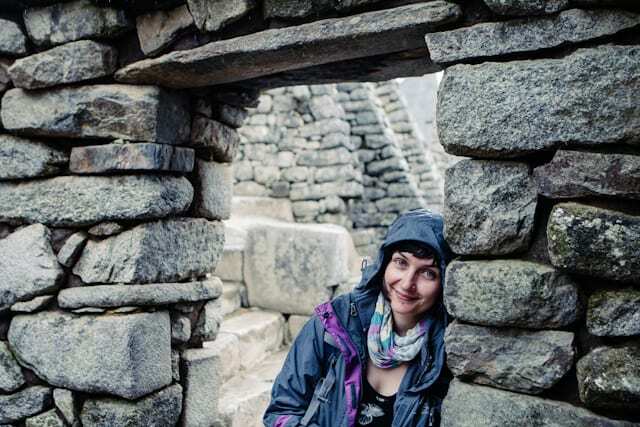 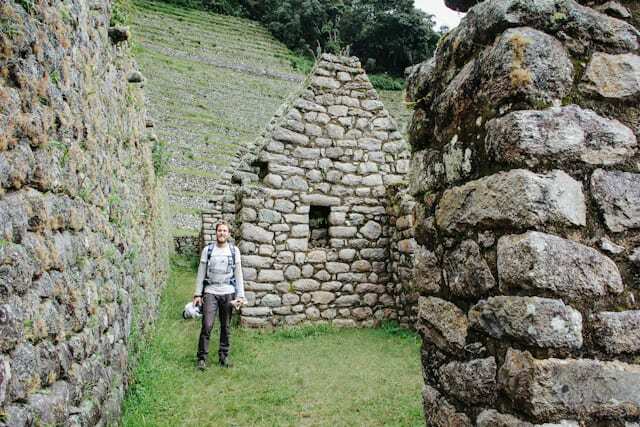 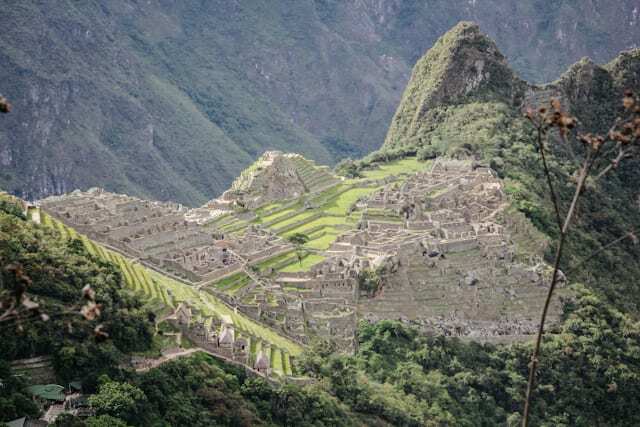 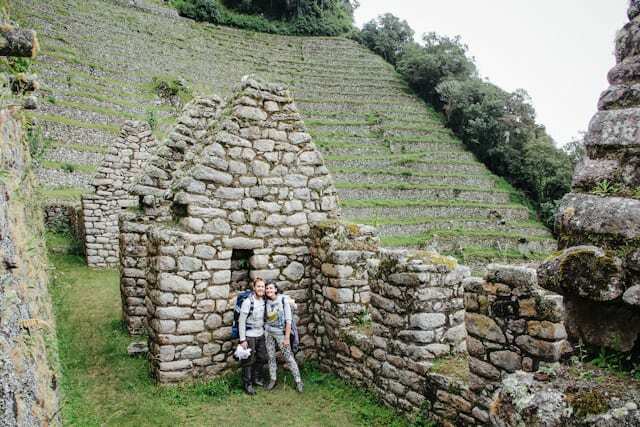 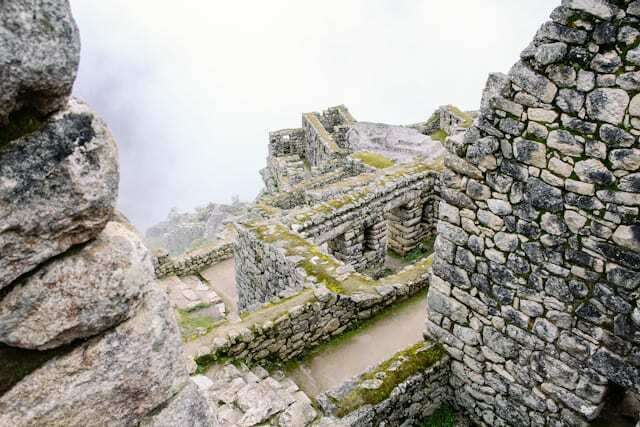 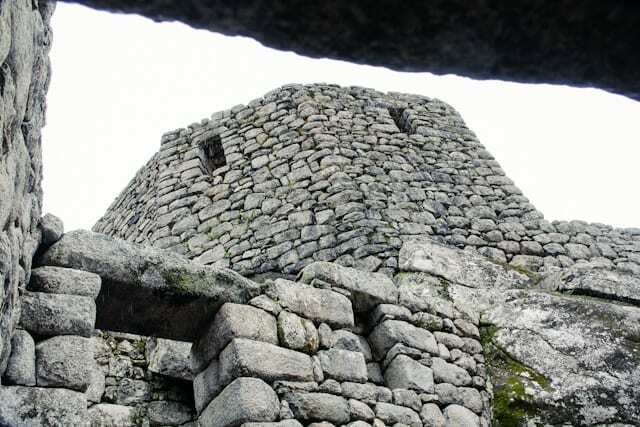 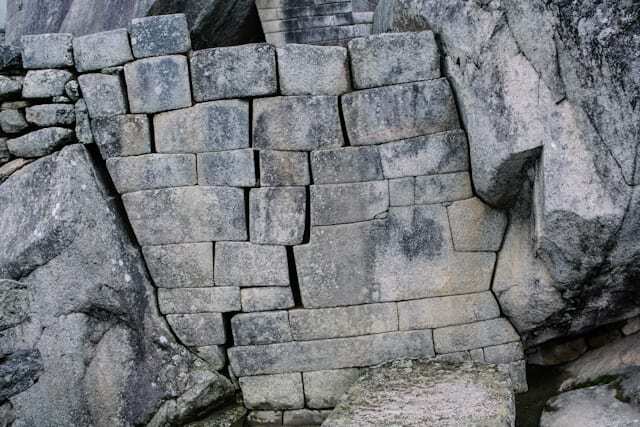 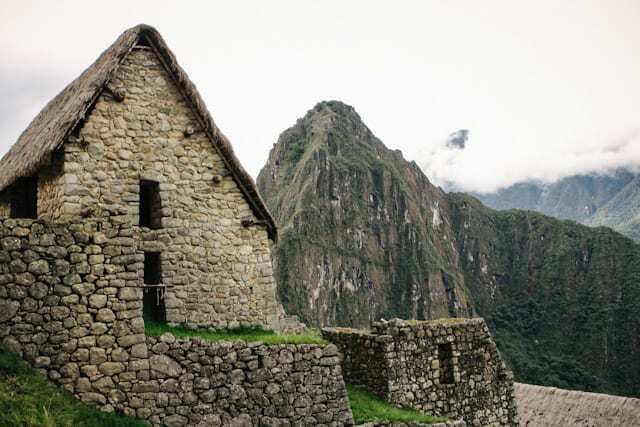 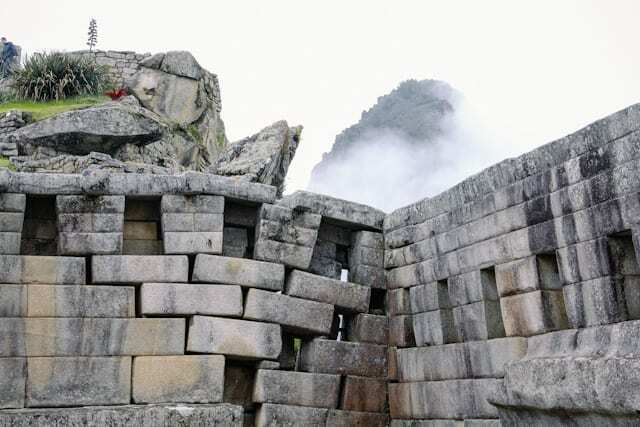 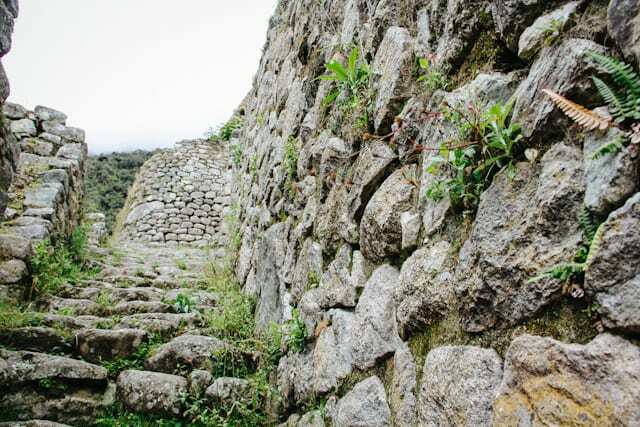 Archaeologists and workers are contantly repairing Macchu Picchu.